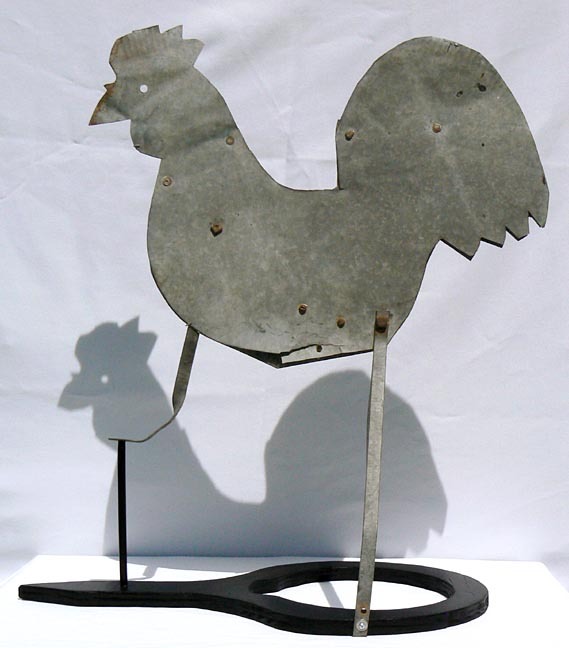 Pictures of General Folk art, antiques, and outsider art, list #15 at Artisans. 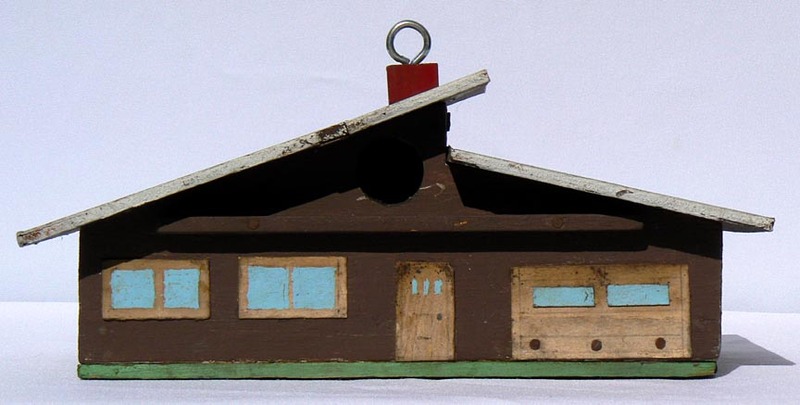 This is a nice small birdhouse made in the style of a 1950's ranch house. 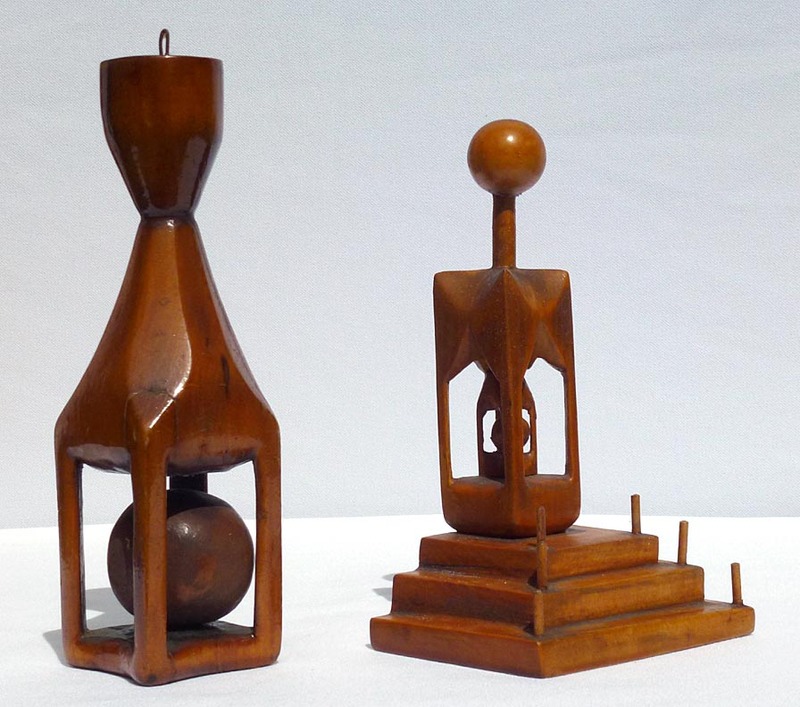 It is in excellent, old condition, with good color, detail, and form. 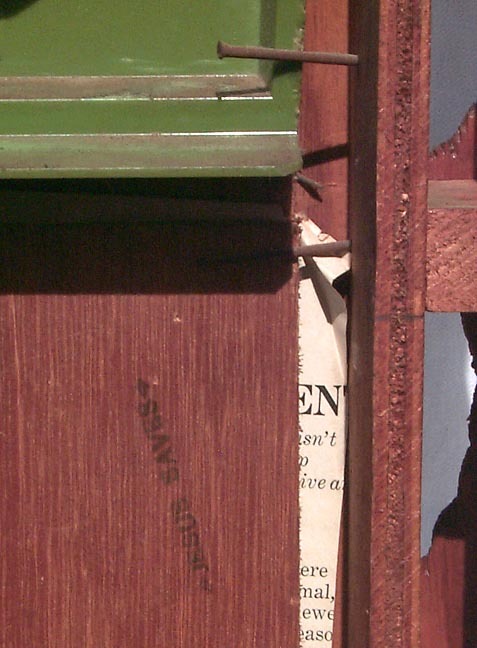 The walls are made from 3/4" pine, while the roof and bottom are 1/4" plywood. 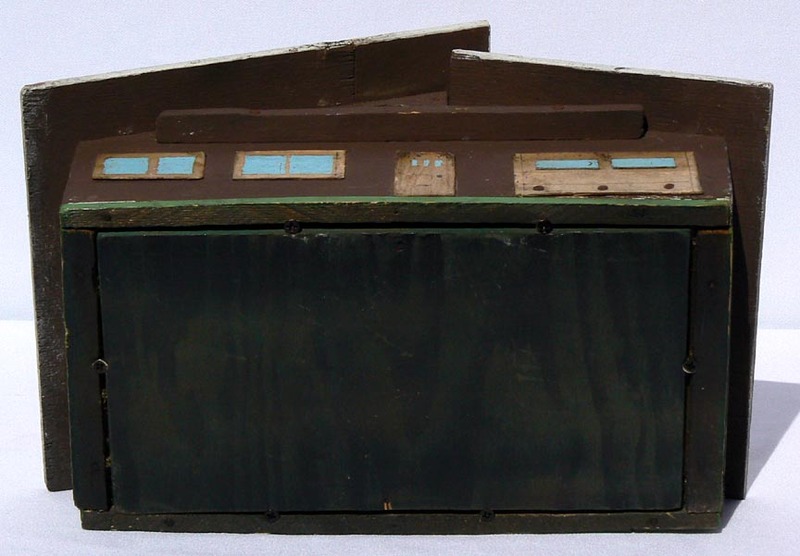 The decorative doors and window are from veneer, with small cut pieces and layering of the windows on the garage doors. They have all been painted in great detail. 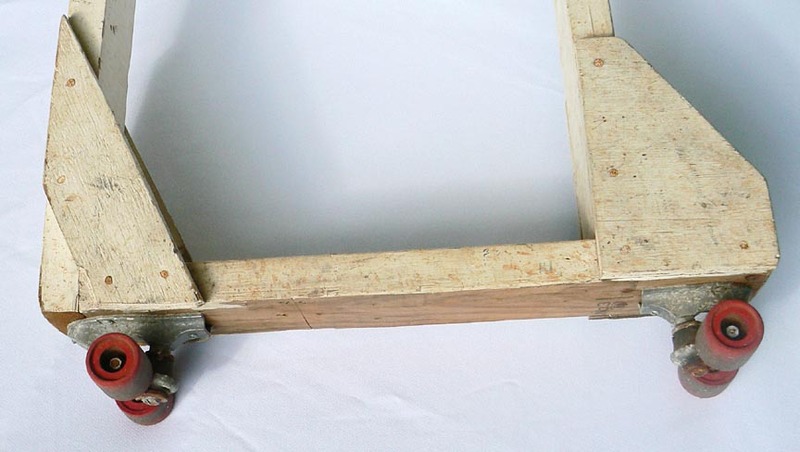 The bottom of the house is held by screws so it can be removed for cleaning. 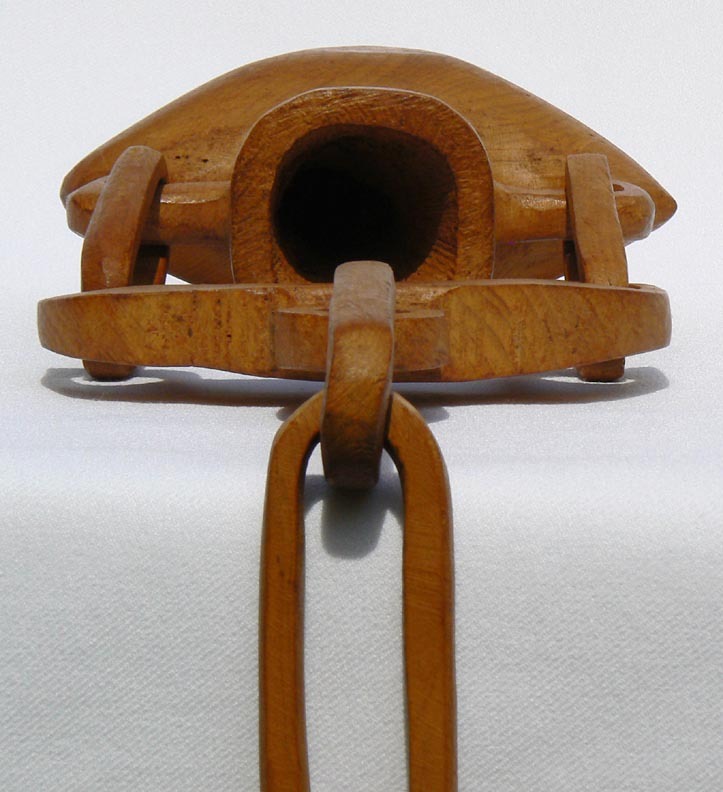 The birdhouse is 11" long by 7" deep, and 5 3/4" to the top of the hanging screw eye. It is likely from the 1970's or so. The price is $225.00. Inventory Code: TOWW. 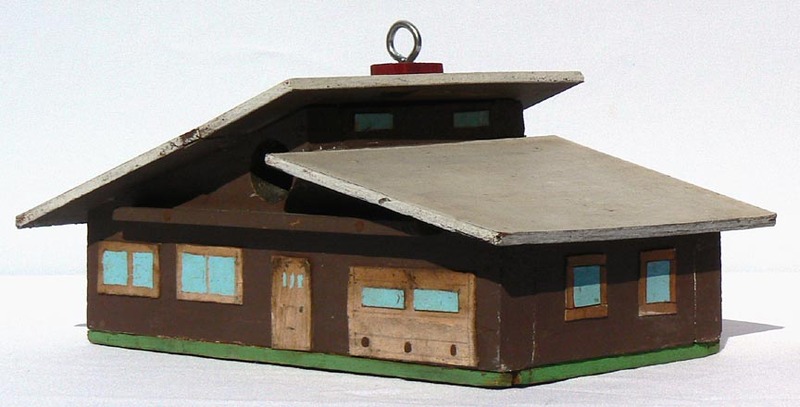 See a slideshow of several views [401k] ... Ranch style birdhouse ... Another view ... Front view ... Side view ... The other side ... Back view ... Closeup of detail ... From above ... From below ... With a soda can for scale. 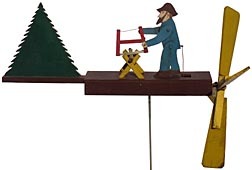 This is a nicely painted whirligig of a bearded man sawing wood. 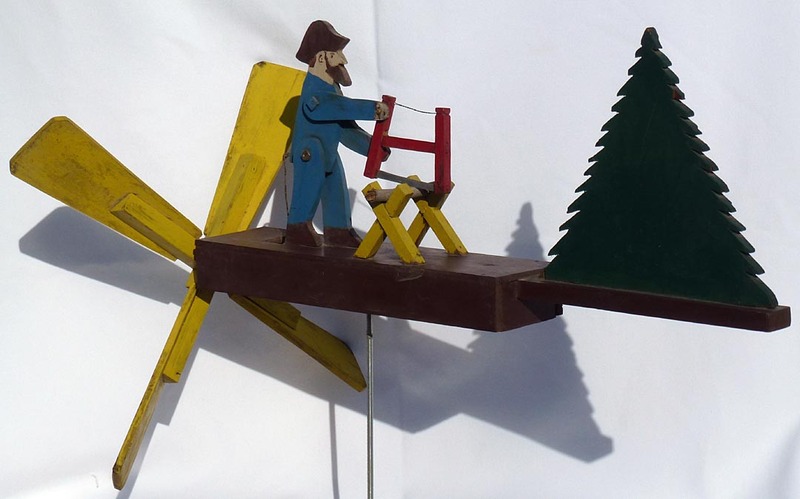 It is made of wood with four yellow blades and a pine tree for a tail. 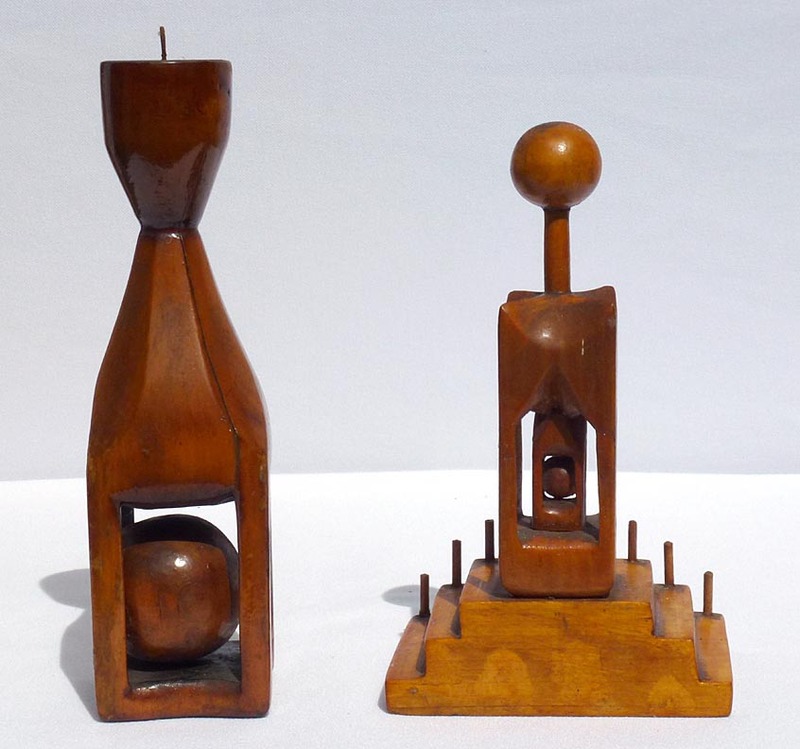 From the second half of the 20th c., it is in very good, weathered condition. It has been mounted on a newer wood base. 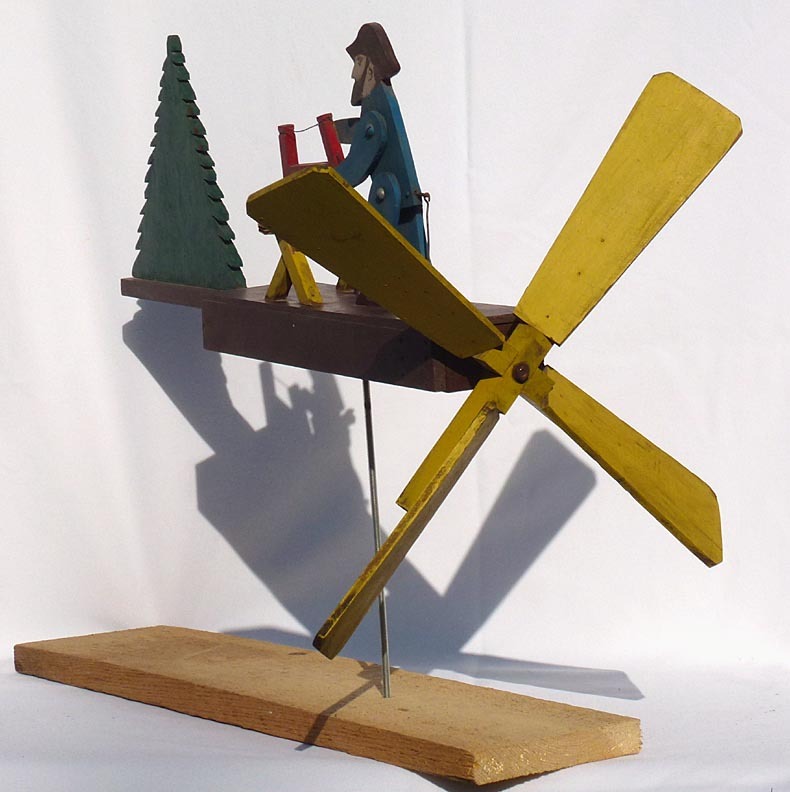 The whirligig itself is 26" long. 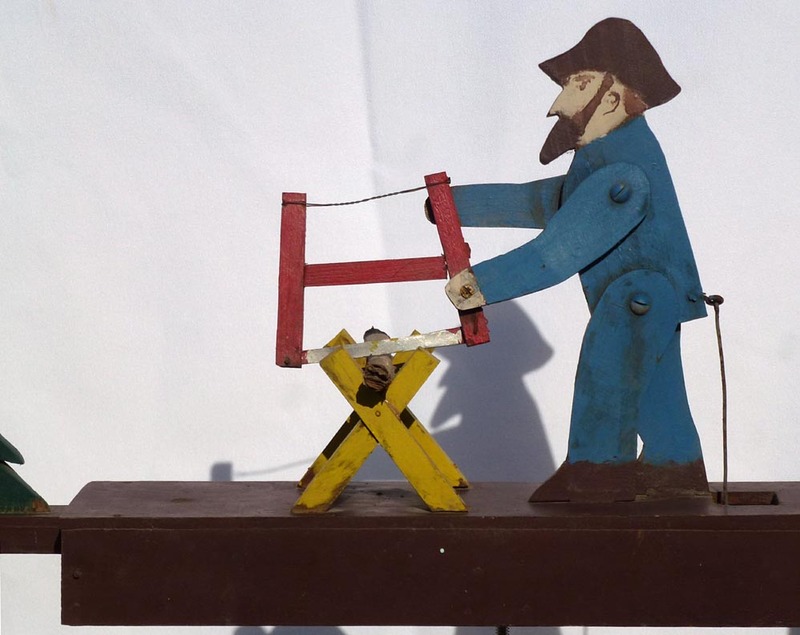 The blade is 18" across and the man stands just over 8" tall. 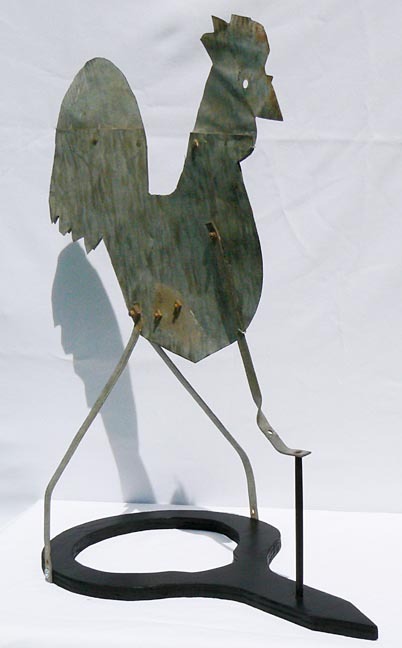 As mounted it is 29" long by 21" high overall. The price is $275.00. Inventory Code: CTAT. 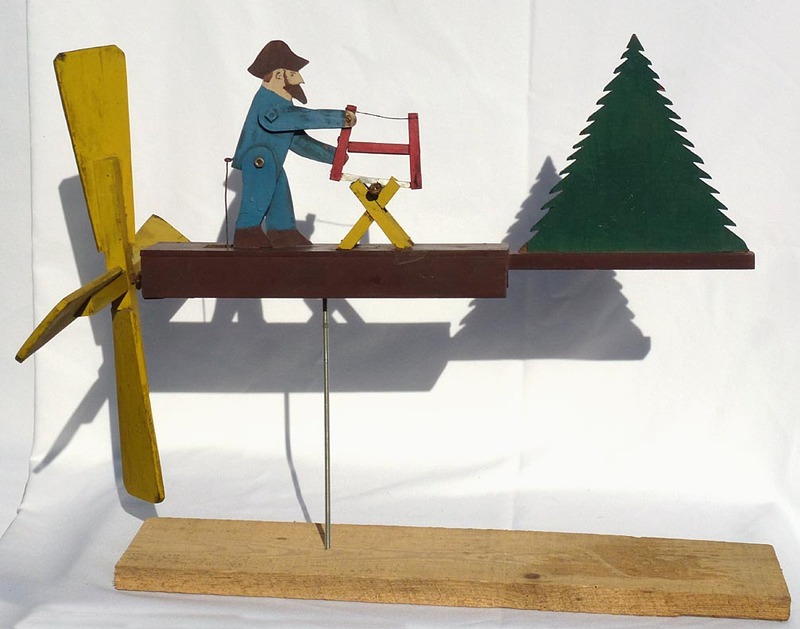 Wood cutter whirligig ... The other side ... Another angle ... Front view ... Closeup ... Closer view of man ... Closeup, sawing ... From above ... With a soda can for scale ... Video of the action. 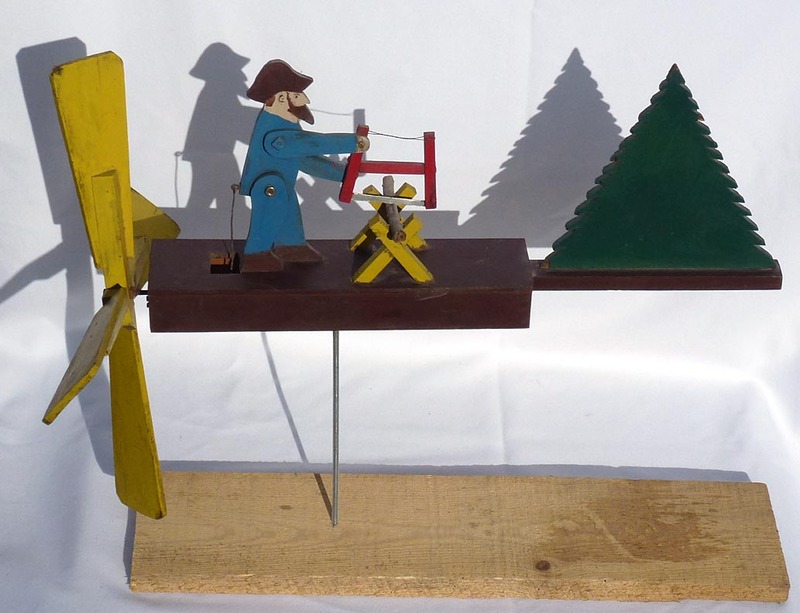 Some much larger photos: Wood cutter whirligig ... The other side ... Another angle ... Front view ... Closeup ... Closer view of man ... Closeup, sawing ... From above ... With a soda can for scale ... Video of the action. 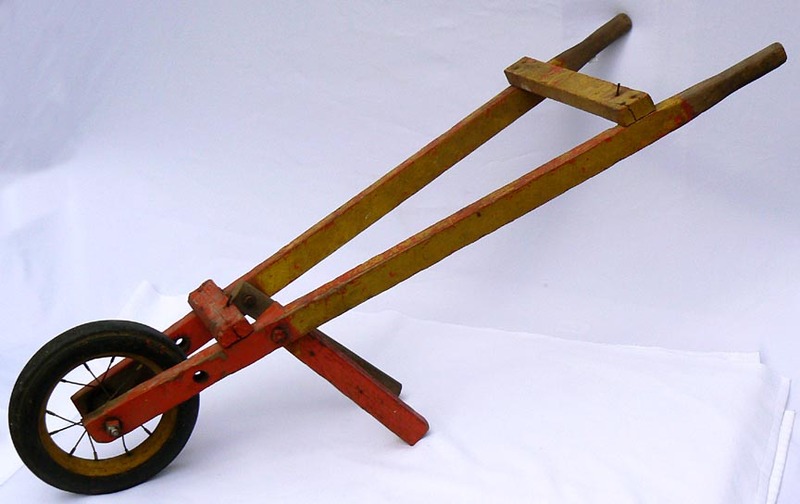 This primitive, hand made, folding wheelbarrow is painted in layers of yellow and orange. This cool, funky piece has a lot of character, and would look great in the garden, standing in a corner, or folded and hung on a wall. 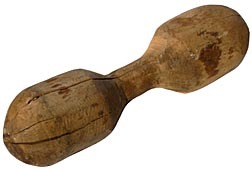 The date "1960" is carved into the handle. 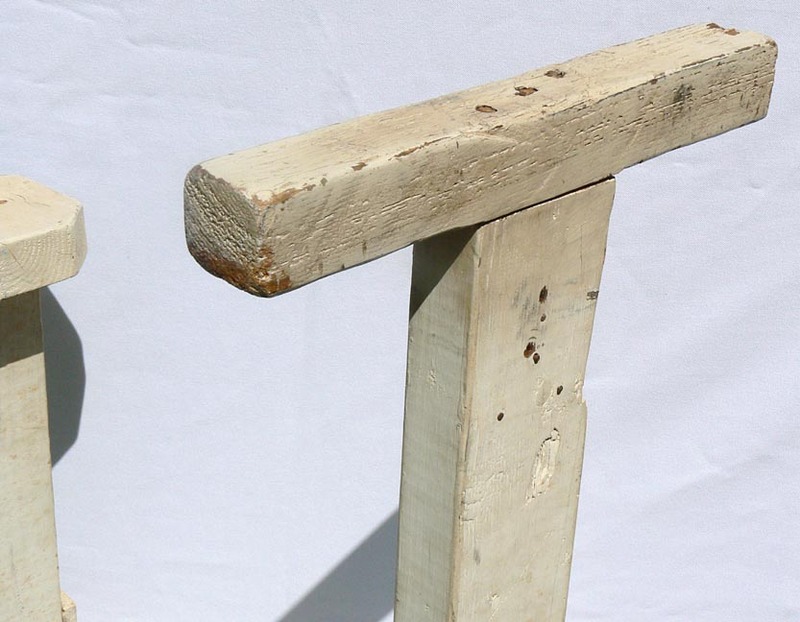 One of the folding uprights was replaced a long time ago with an unpainted piece that appears to be part of an axe handle. 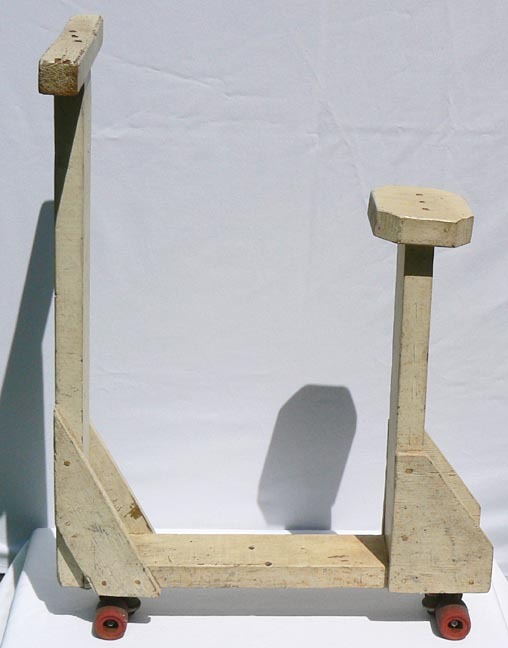 It is 44" long by 17 1/2" wide across the handles. 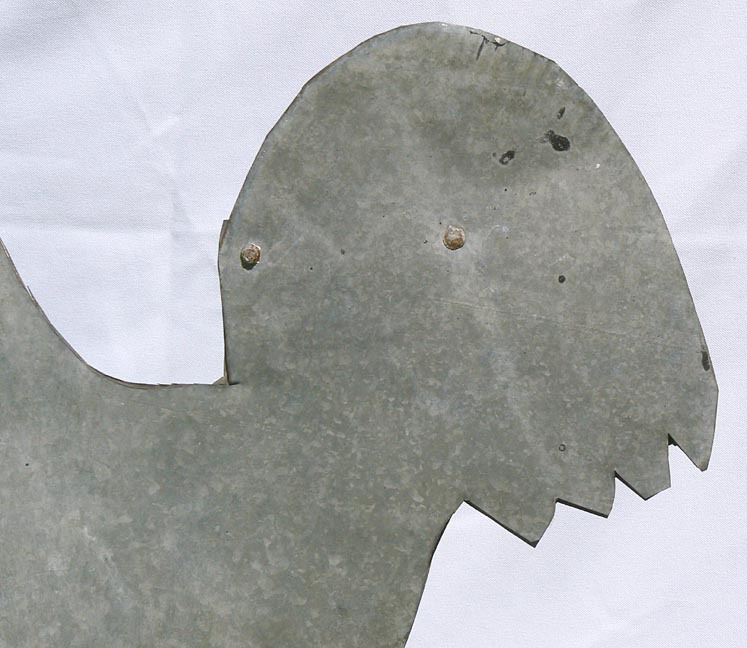 When unfolded, it stands about 2 feet high. 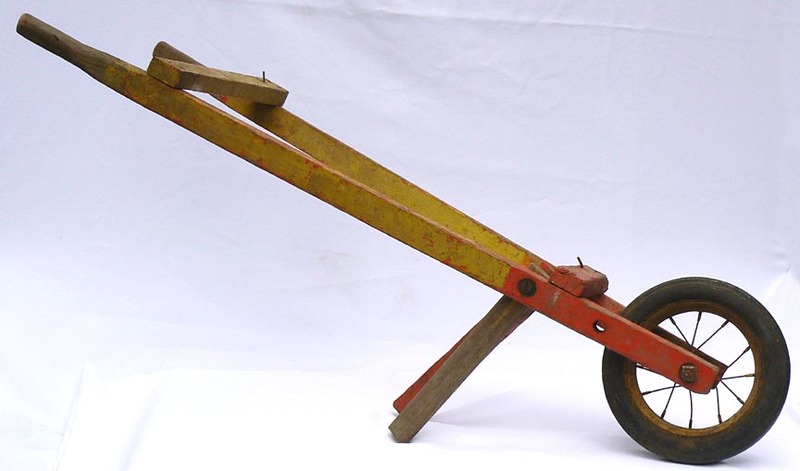 It is in very good, used and weathered condition. The price is $125.00. Inventory Code: TARR. 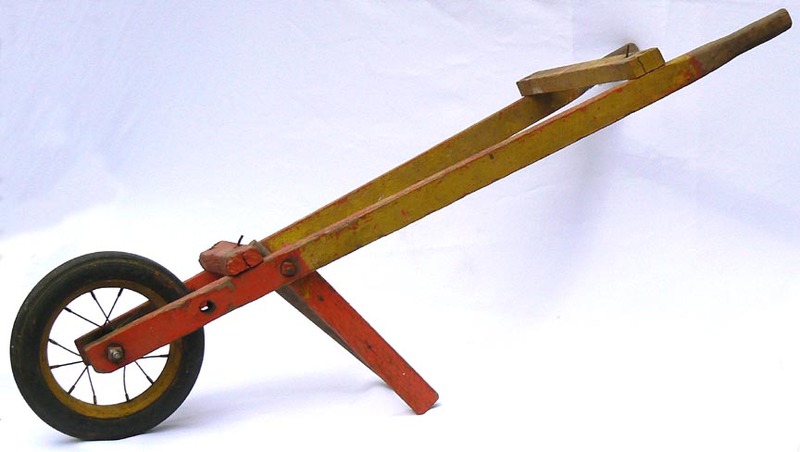 Primitive wheelbarrow ... Another view ... Closeup of the wheel ... Closeup of the handle, with date ... One side ... The other side ... From above. 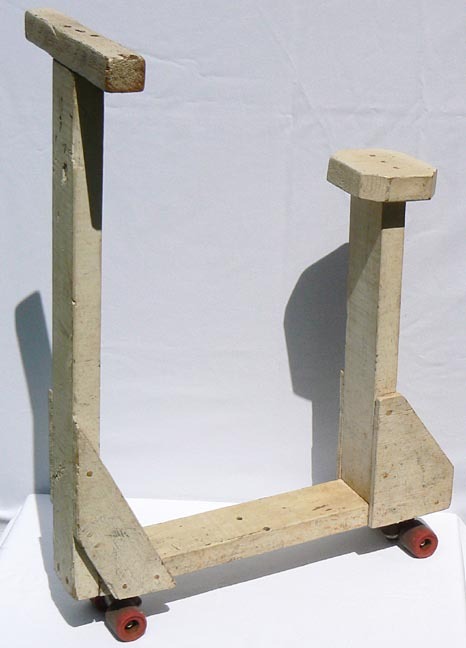 This is a folky home made wooden scooter. 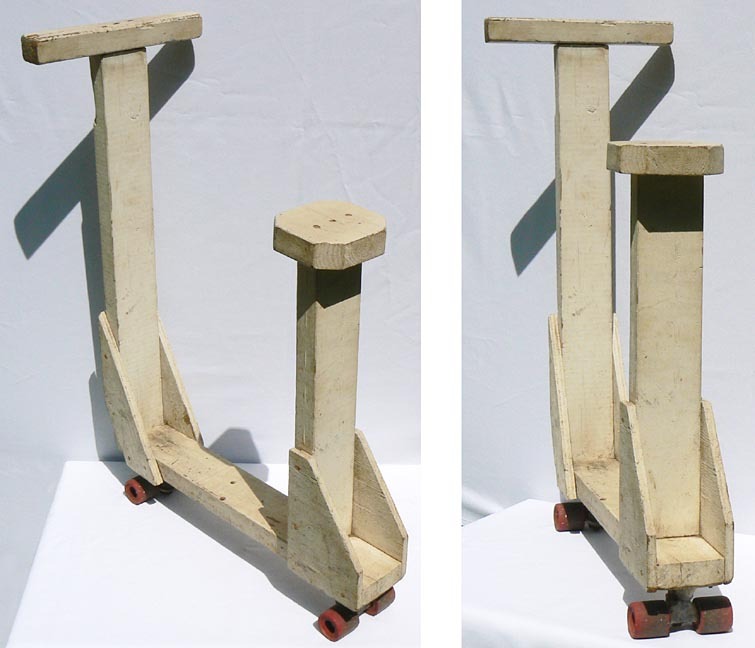 It was constructed from 2 x 4's with triangular supports made from 3/4" plywood. 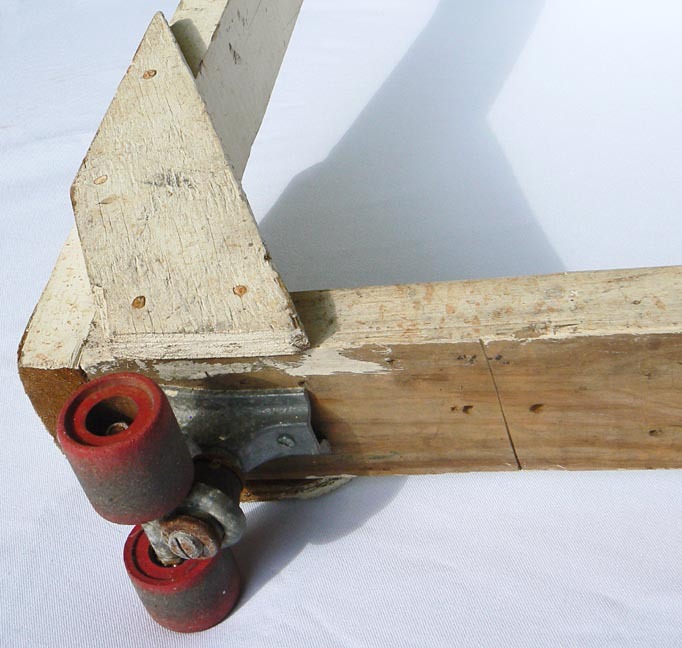 The wheels are from an early skate board mechanism or roller skates. 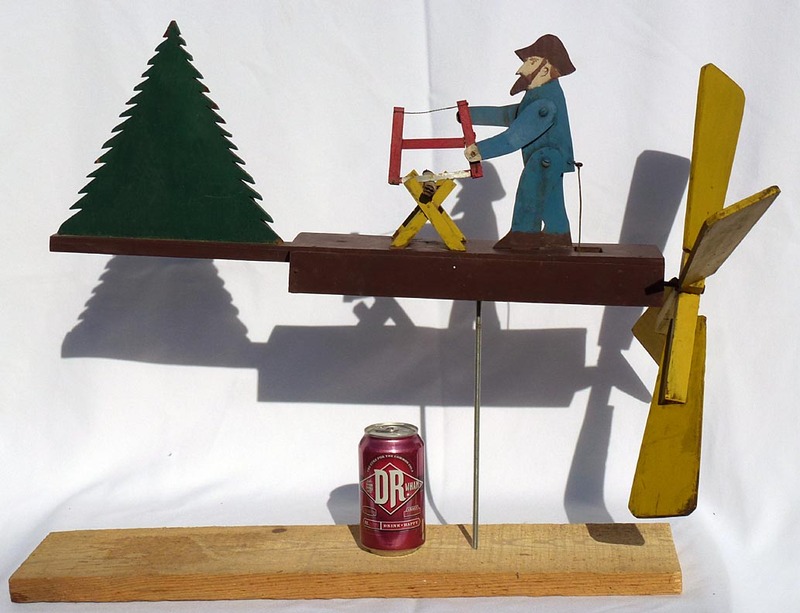 This was probably made in the early 1960's. 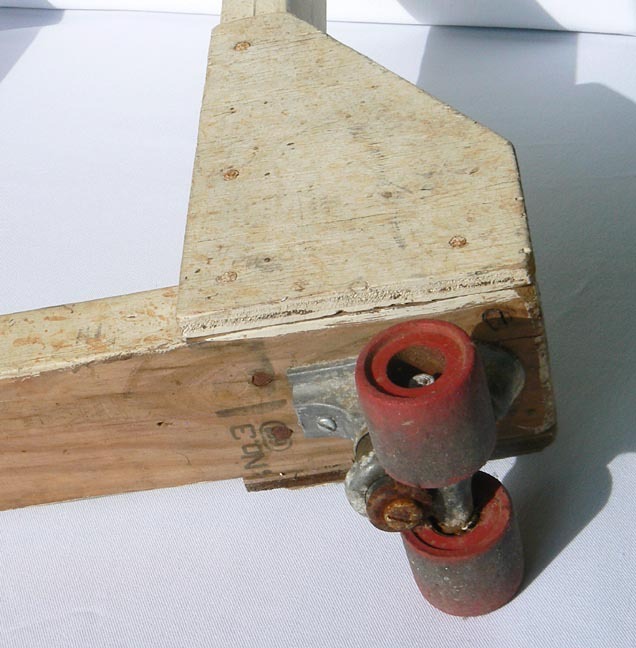 It is sturdy, rolls well, and certainly can be used. 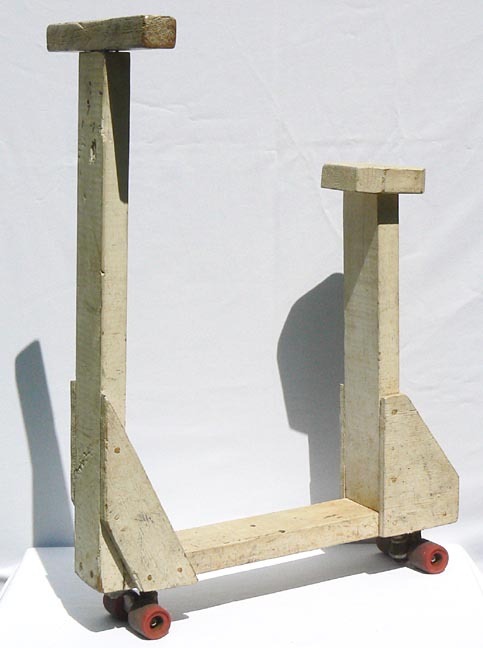 The scooter was painted white, and the paint has a fair amount of wear from riding. 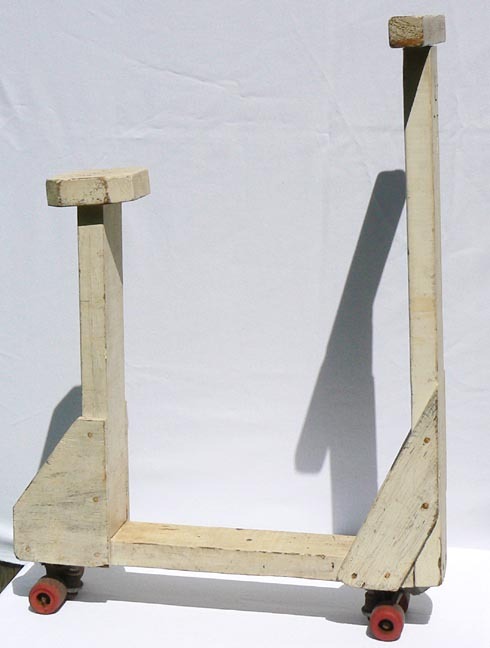 It is 22 3/4" long by 33" high by 12 1/8" wide. The price is $110.00. Inventory Code: TOCS. Home made scooter ... Closeup of handles ... One side view ... The other side ... Front view ... Back view ... From above ... Another view from above ... Closeup of seat ... Lower front ... Lower back ... From below ... Closeup of front wheels ... Closeup of rear wheels ... With a soda can for scale. 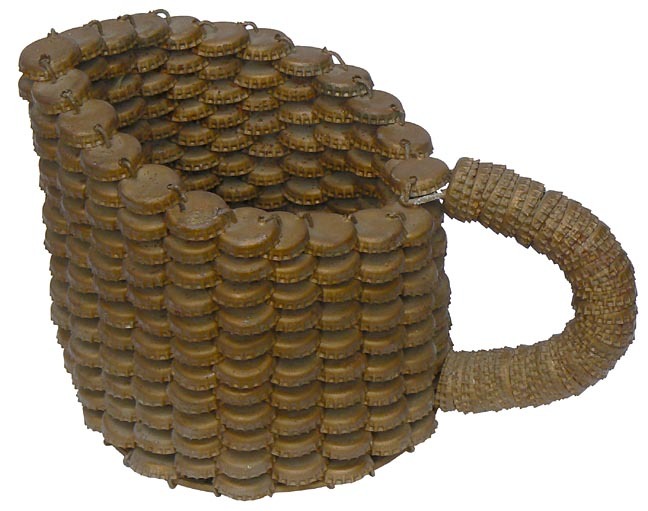 This is a pitcher made from bottle caps, with a large can lid for the bottom. 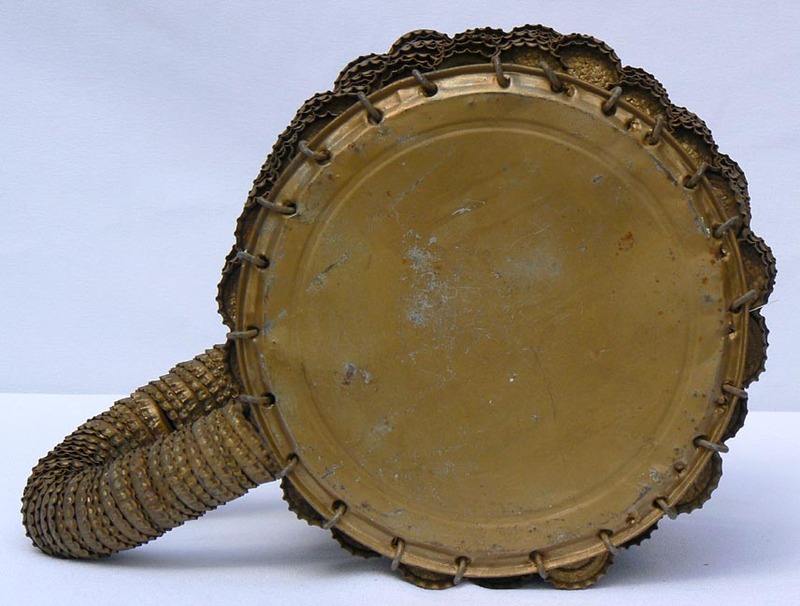 It has very good form, and is painted a dark, oxidized gold. 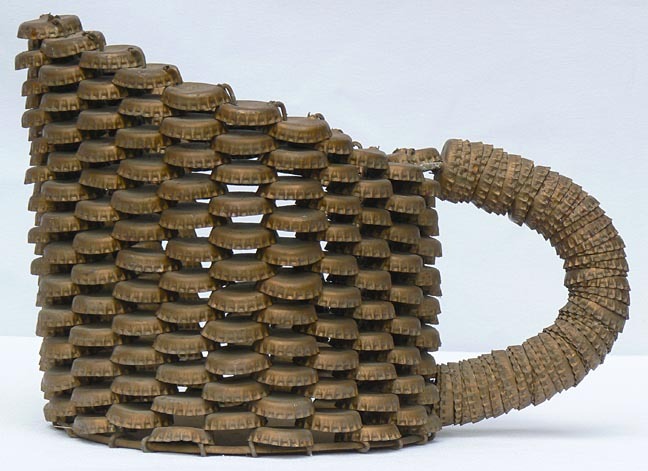 This is an older piece, made from cork-lined caps. You can just make out that one or two of the caps are from Coca-Cola. 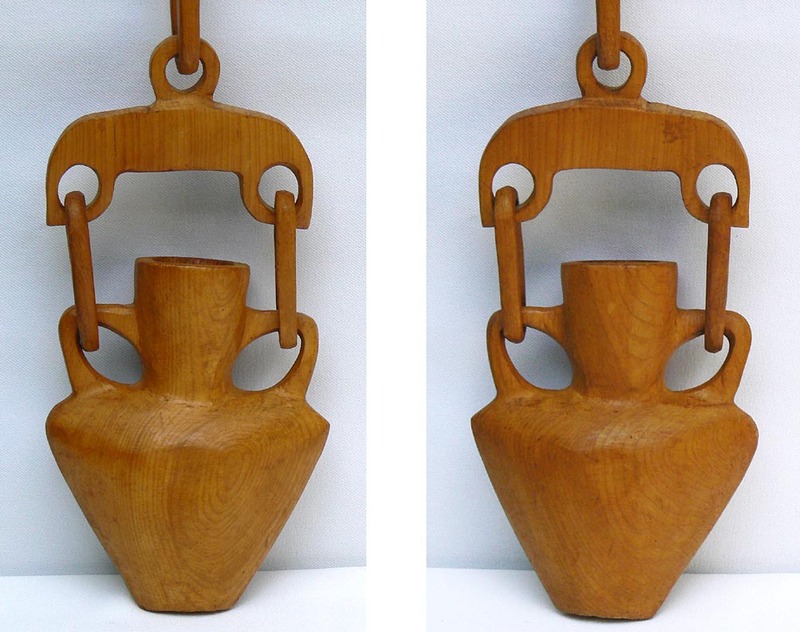 The pitcher is in very good condition with minor paint wear. 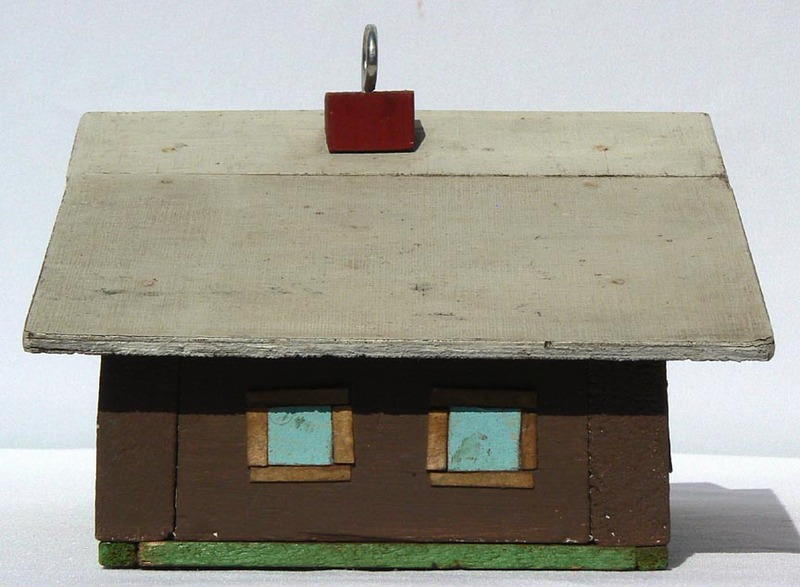 It stands 7 1/4" high by 11" long by 7" wide. The price is $275.00. Inventory Code: TCHC. 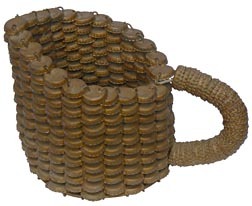 Bottle cap pitcher ... Side view ... The other side ... From above ... Two front views ... Back view ... From below ... Closeup from above ... Closeup from below. 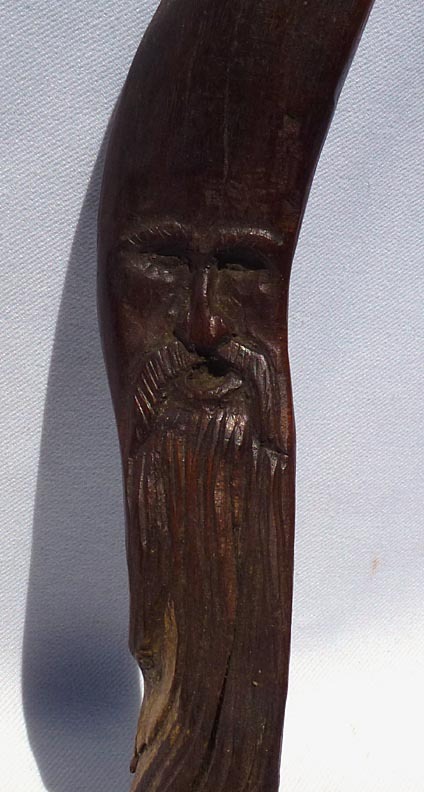 This is the carved face of a bearded man, like a wizard. He seems to emerge naturally from the form of the twisted branch, and his beard merges into the weathered end. 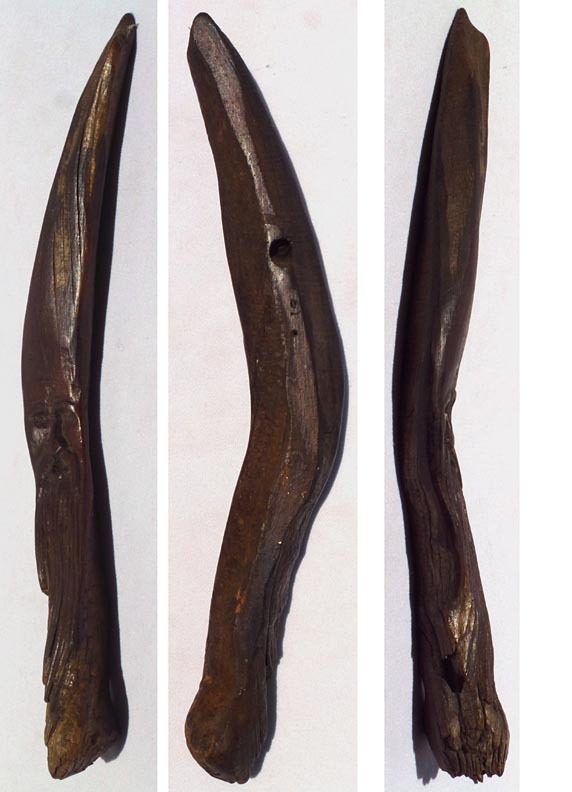 It has a dark varnish finish with a smooth patina, worn at the ends. 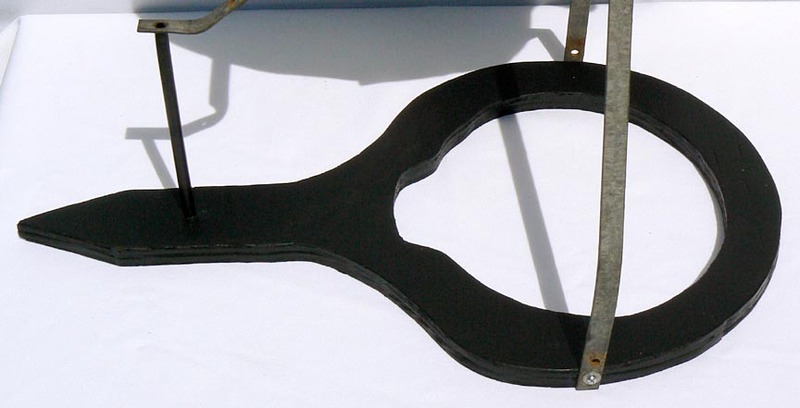 There is a hole on the back for hanging. It is about 13" long by 2 1/2" wide by 1 1/2" deep. 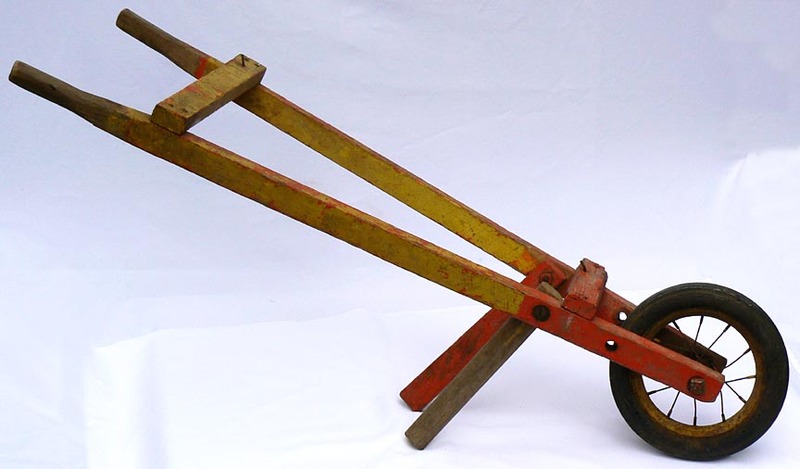 Age is probably from the mid-20th century, or a bit older. The price is $95.00. Inventory Code: TKWH. Wizard carving, with a soda can for scale ... Closeup ... Side and back views. 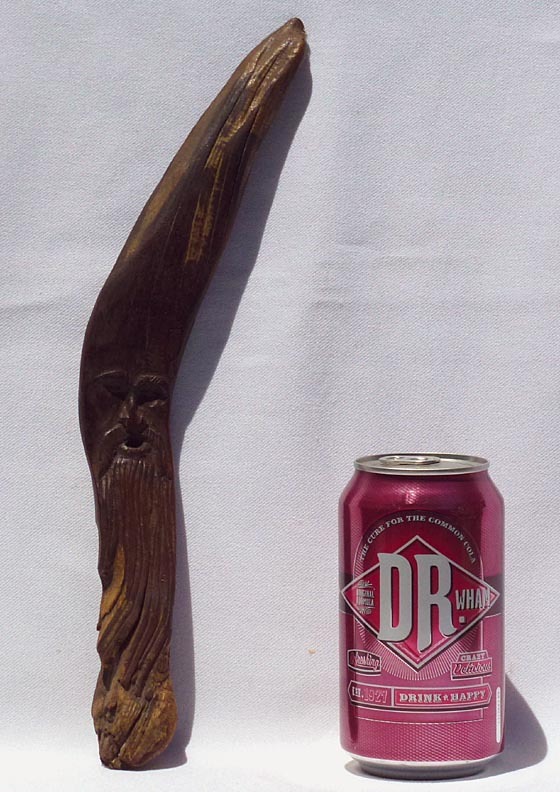 Some much larger photos: Wizard carving, with a soda can for scale ... Closeup ... Side and back views. 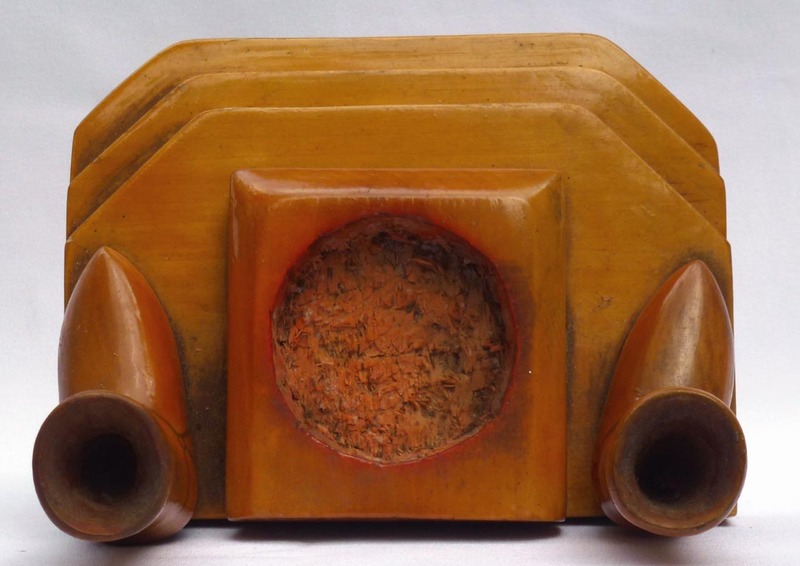 This is a heavy, hand carved wood dumbbell. 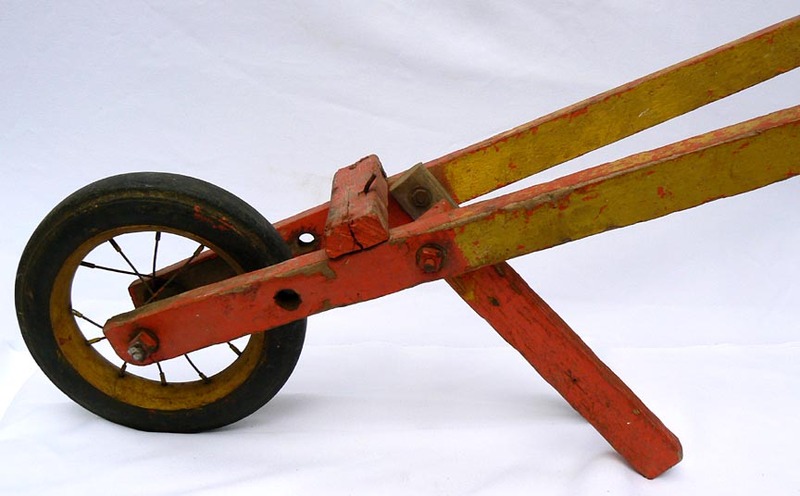 Obviously a homemade piece, it could have been for exercise or used in a carnival. 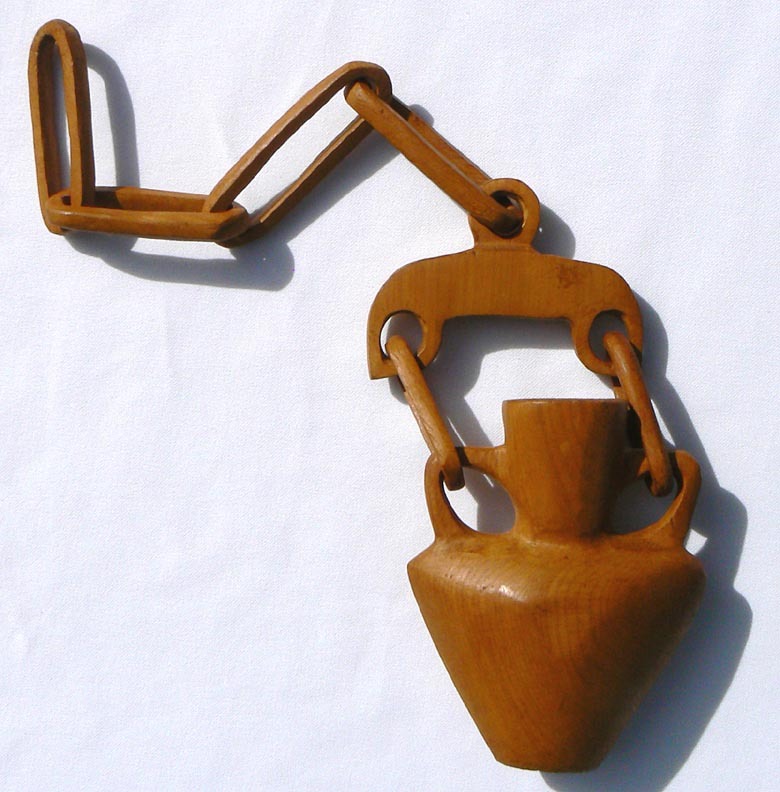 In any case, it was used often and has the patina and smoothness on the handle to show. 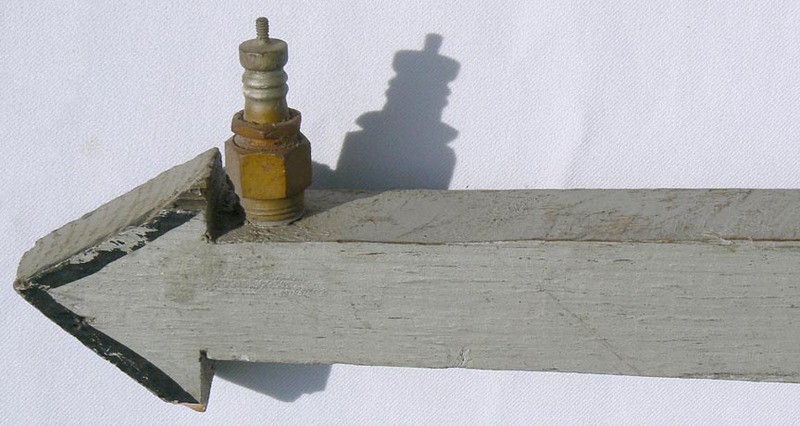 The dumbbell is old, likely from the early 1900's. 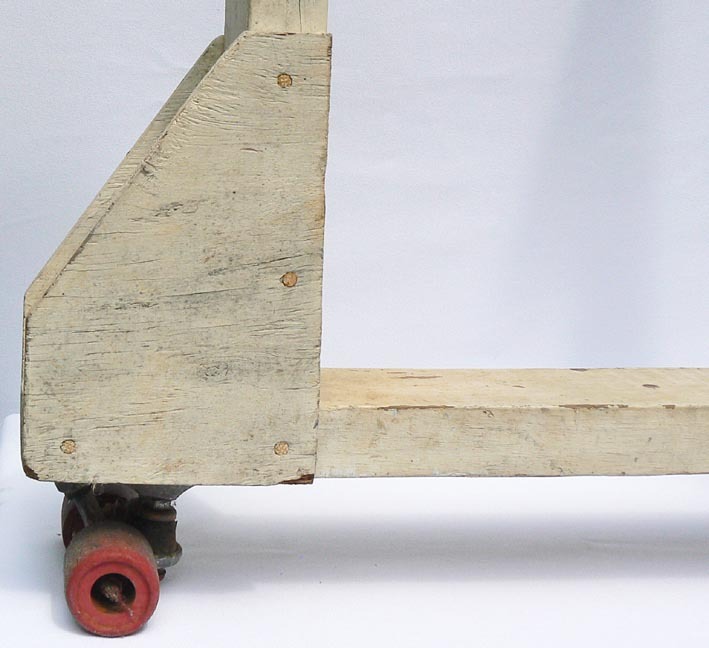 It has age cracks, but is still strong and in very good condition. 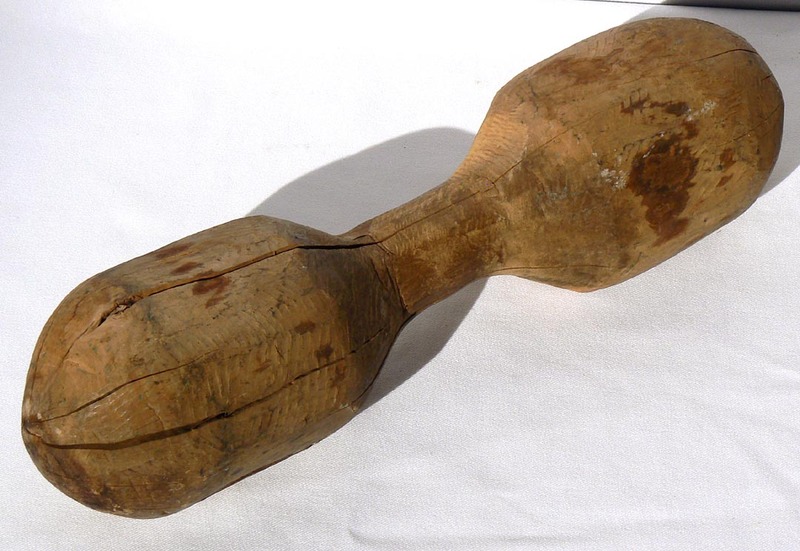 It is about 17" long by 5" in diameter on the larger side. The price is $125.00. Inventory Code: CSAT. See a slideshow of several views [430k] ... 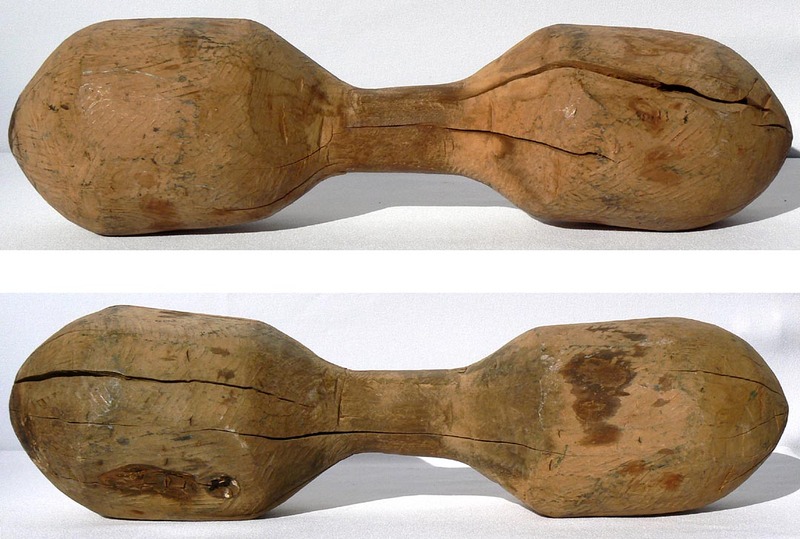 Wooden dumbbell ... Another angle ... Two more views ... End view ... 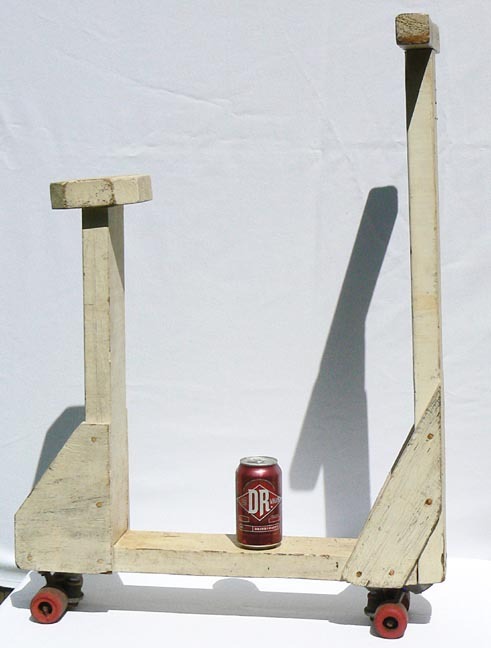 The other end ... With a soda can for scale. 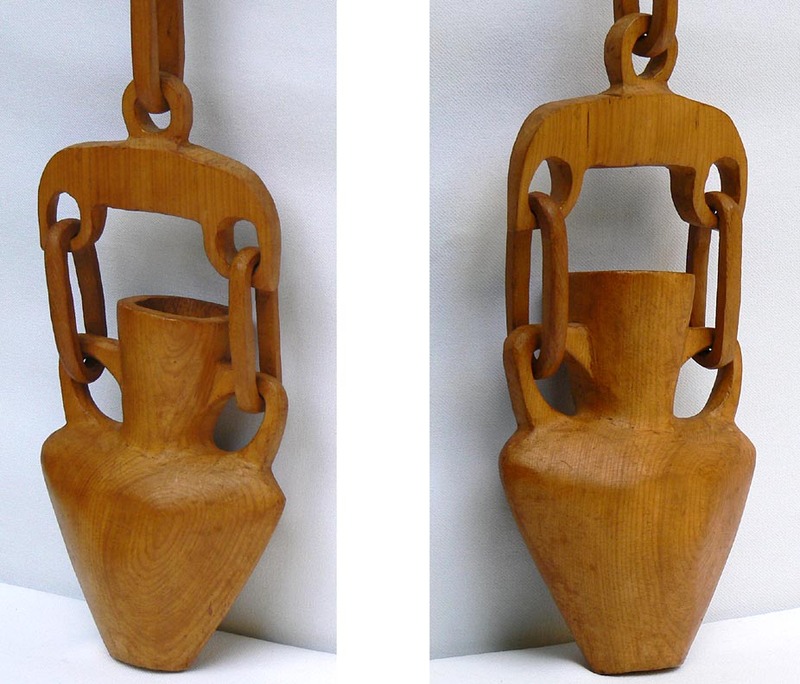 Some much larger photos: Wooden dumbbell ... Two more views. 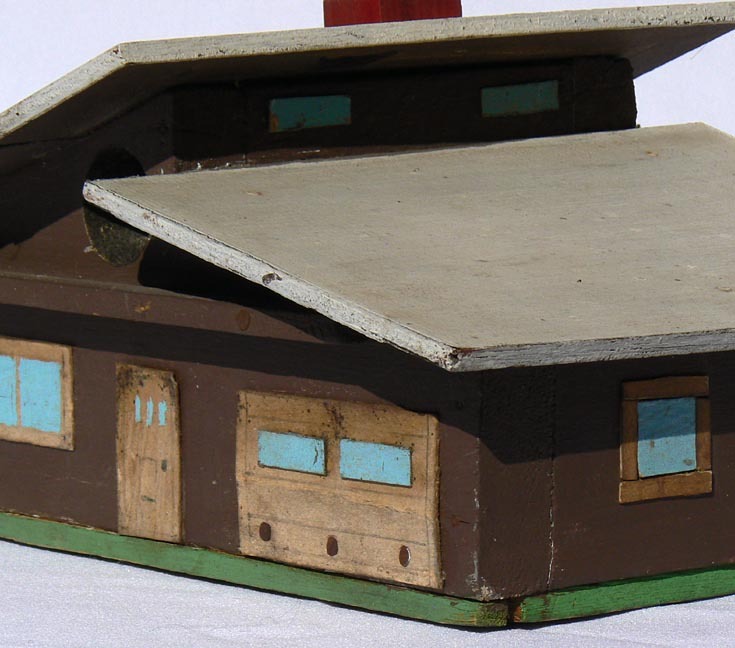 This is a birdhouse in the shape of a Patriot missile. 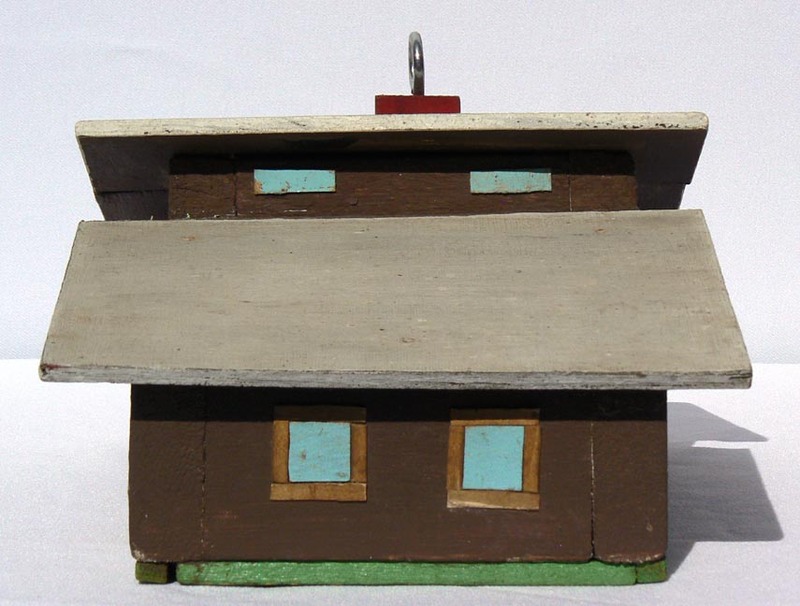 It is one of a group of military birdhouses that were made during the Persian Gulf war by Eugene Poore, from wood and found objects. It is painted red, white and blue with the words "PATRIOT" and "USA". 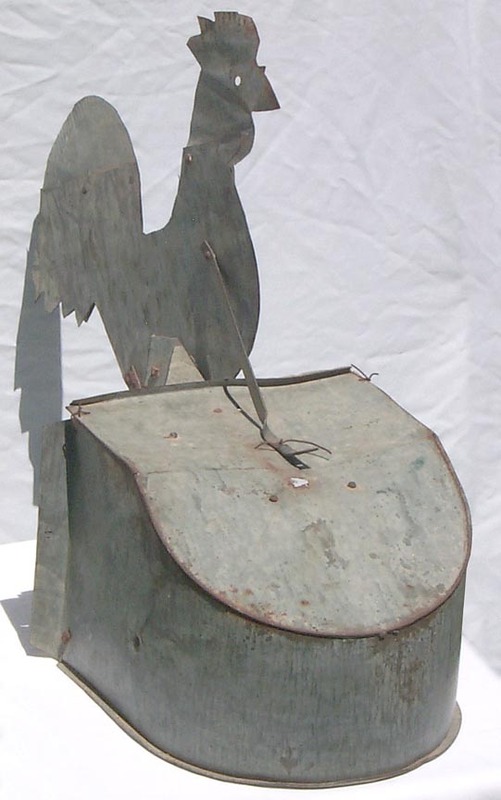 It has two openings for birds, and is 28" high by 4 1/2" in diameter.The price is $195.00. Inventory code: PCHC. Image. 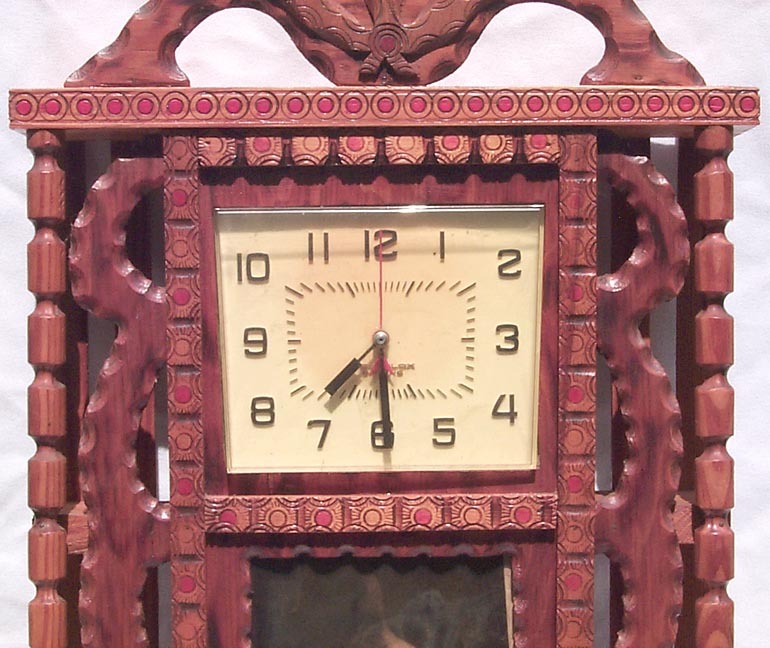 This is a large carved whimsy with a bold look. 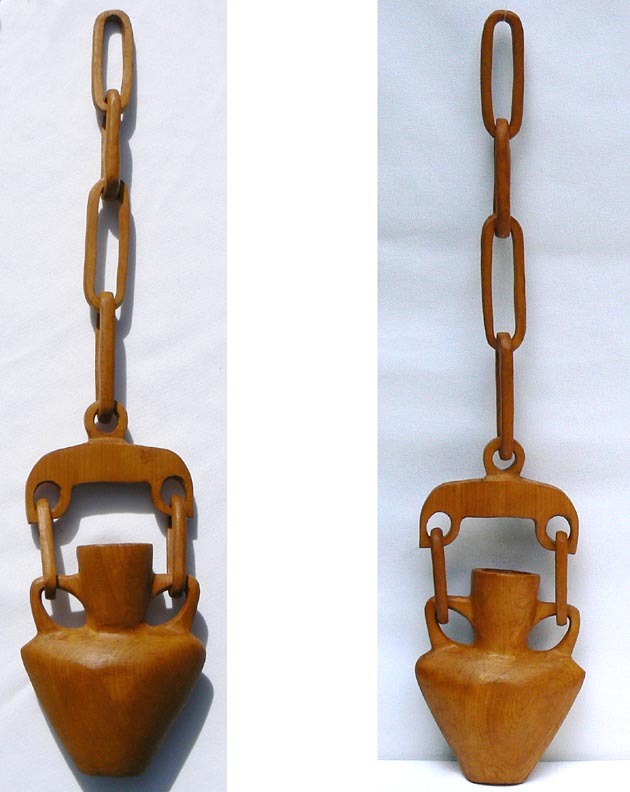 It has a two handled vase suspended by two links from a yoke. 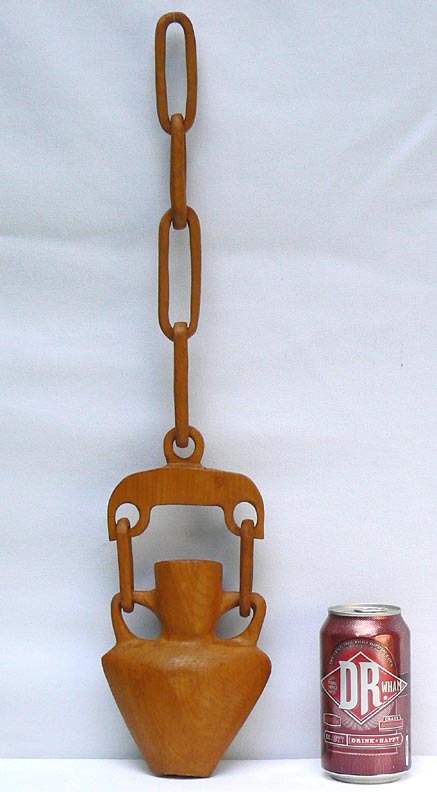 The yoke hangs from four more lengths of chain. 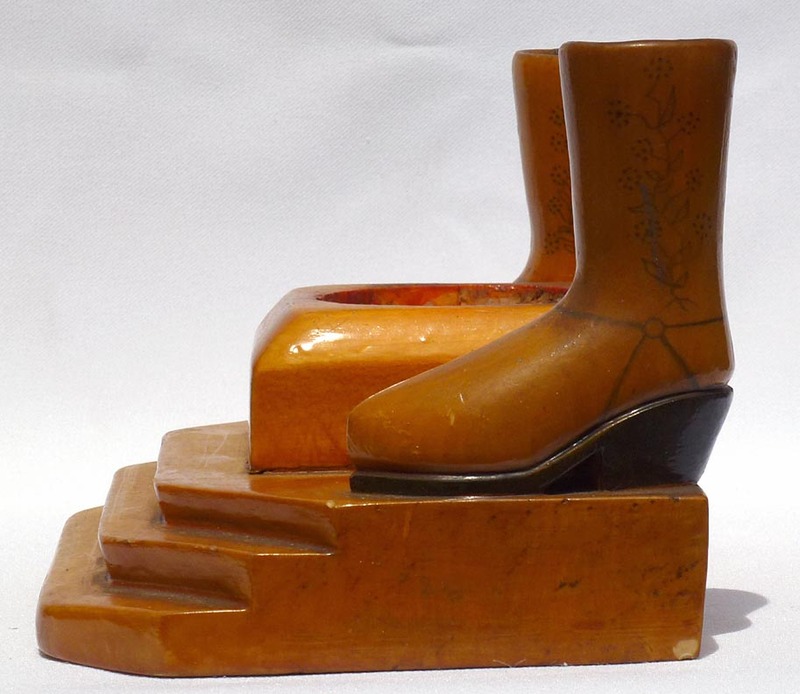 The entire whimsy was carved from a single piece of wood with a smooth, medium natural surface. 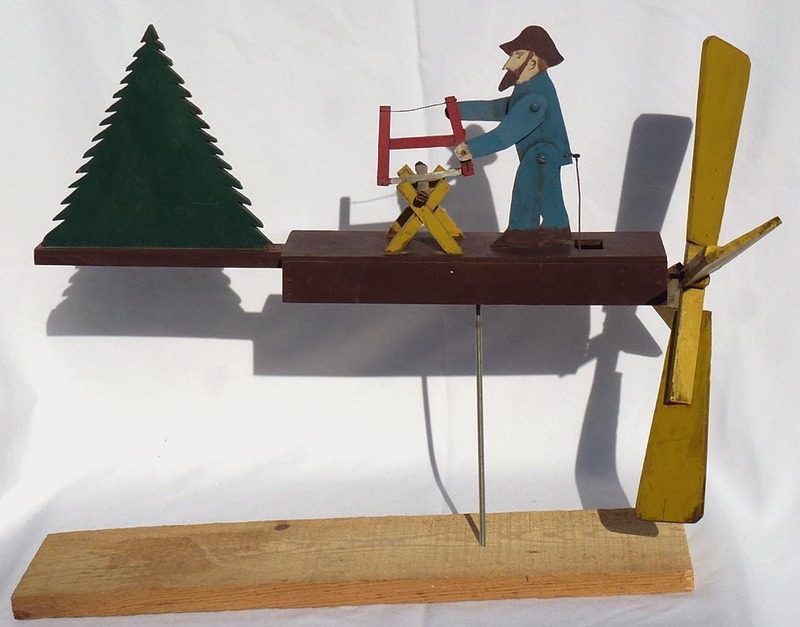 It measures 22" long by 4 3/4" wide by 2" deep and is in excellent condition. 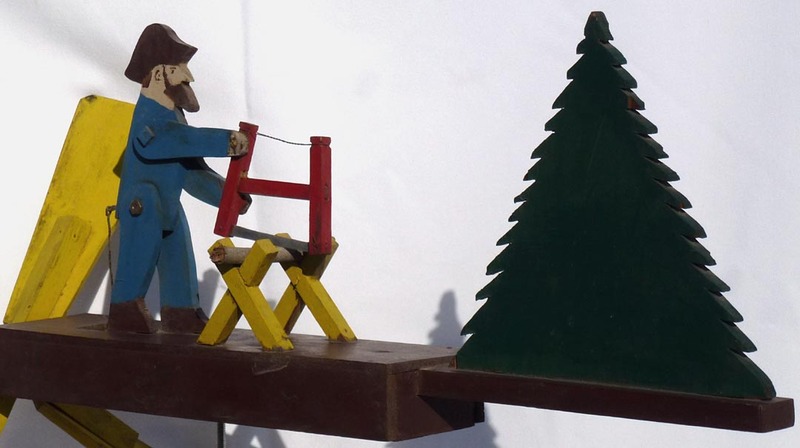 It was probably made in the 1930's or 40's. The price is $275.00. Inventory Code: TRPC. 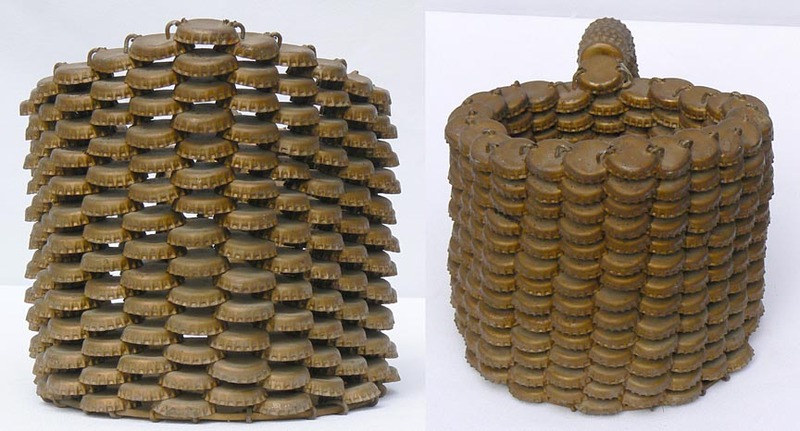 See a slideshow of several views [470k] ... Large hanging vase whimsy carving ... Front and back views ... Side views ... Closeups ... Two more closeups ... Closeup from above ... Another view from above ... With a soda can for scale. Some much larger photos: Front and back views ... Closeup. 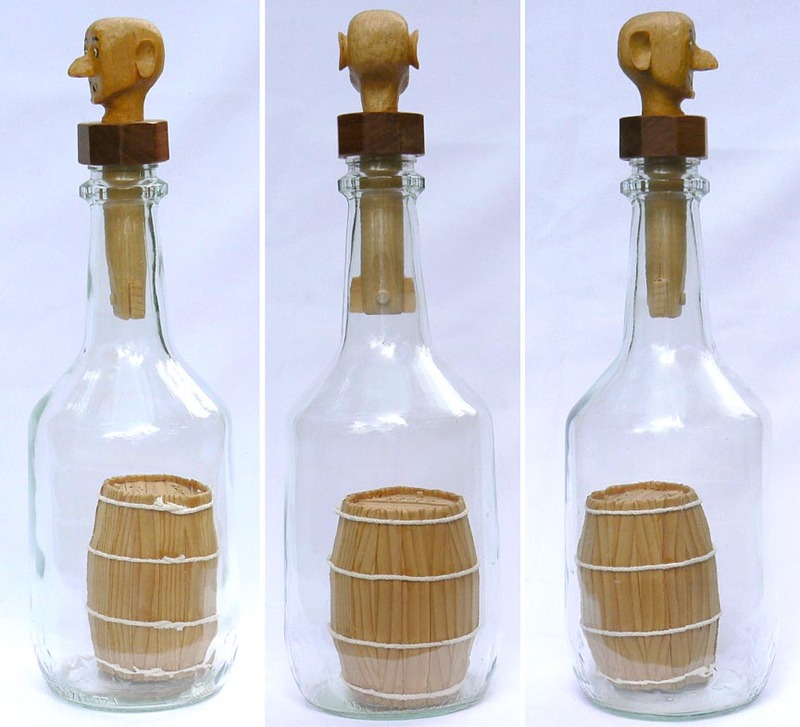 This amusing and interesting bottle whimsey has a barrel built inside and a lock stopper with a folky carved head. 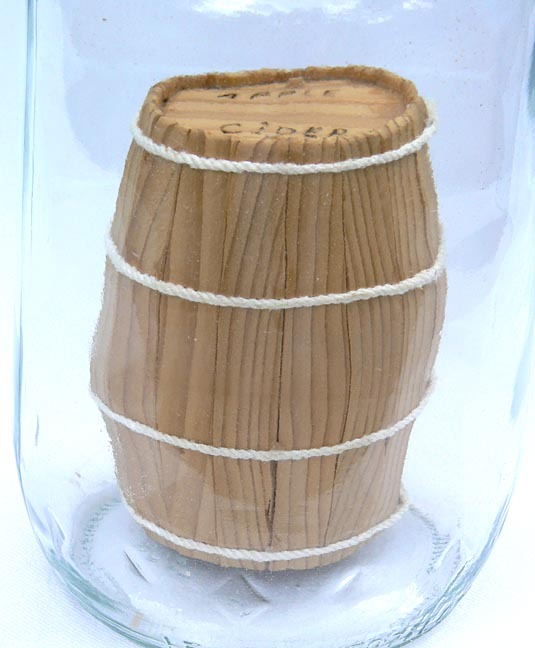 The top and bottom of the barrel were assembled from strips inside the bottle. 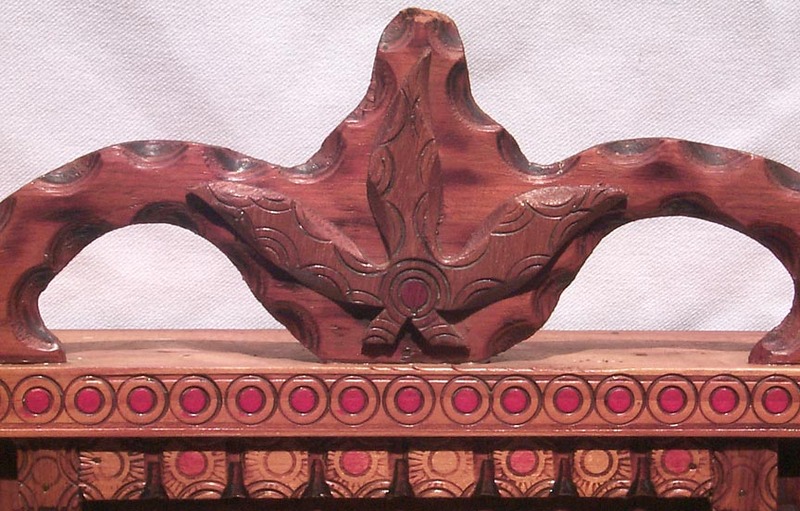 Then, 17 individually carved staves were attached, and fastened with string hoops. 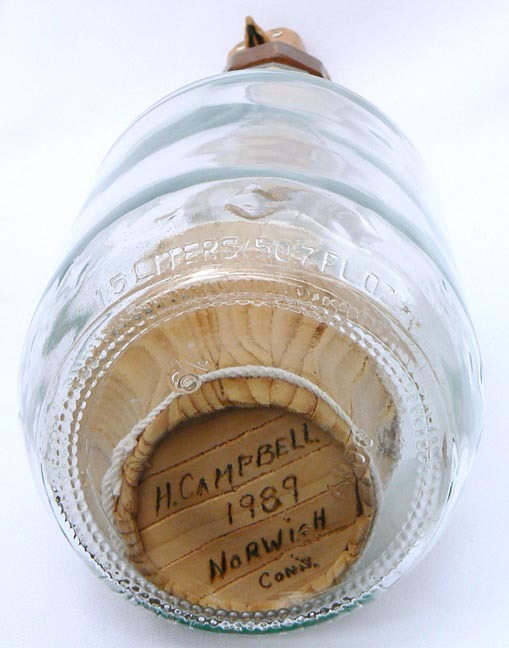 "Apple Cider" is burned into the top, and "H. Campbell, 1989, Norwich Conn." into the bottom of the barrel. 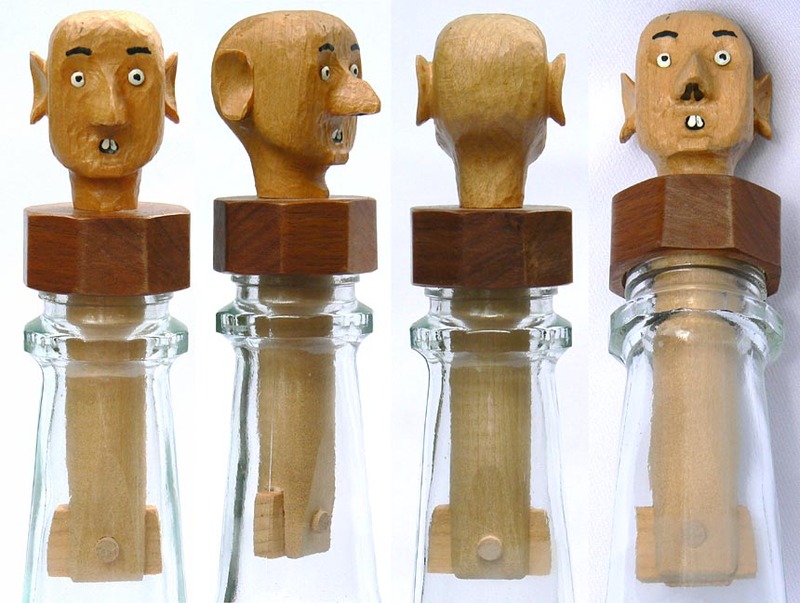 The top of the stopper is carved with a bald head with large ears and nose, and painted eyes, eyebrows, and mouth. 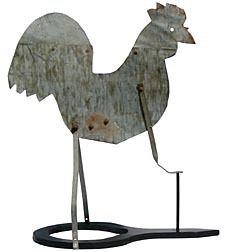 It stands 14 1/2" tall by 4 1/2" in diameter and is in excellent condition. The price is $225.00. Inventory Code: TTKO. 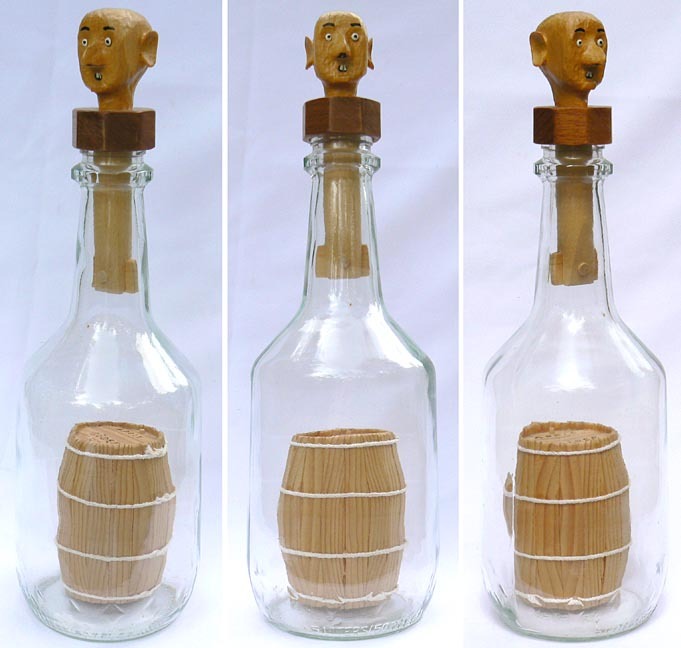 Barrel in a bottle whimsy ... Several more views ... Closeups of the stopper ... The sides and back ... From above ... Closeup of the barrel ... From below, with signature ... Top. 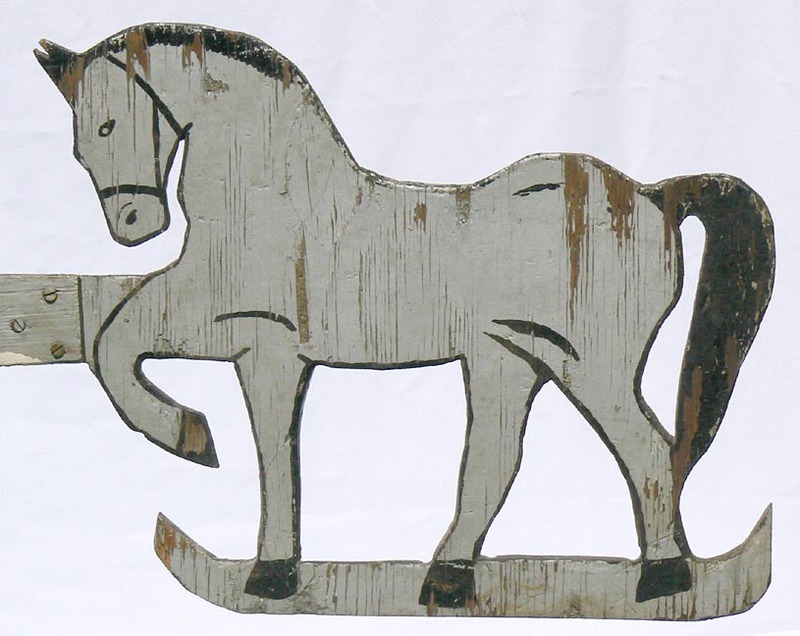 A nice wooden horse weathervane in weathered gray and black paint on both sides. 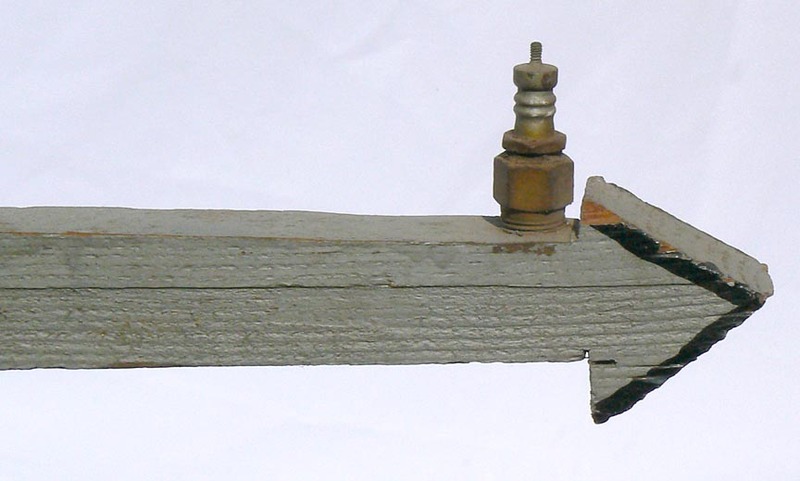 An old spark plug was added to the front of the arrow to make it balance. It is 44 1/2" long by 16" high. 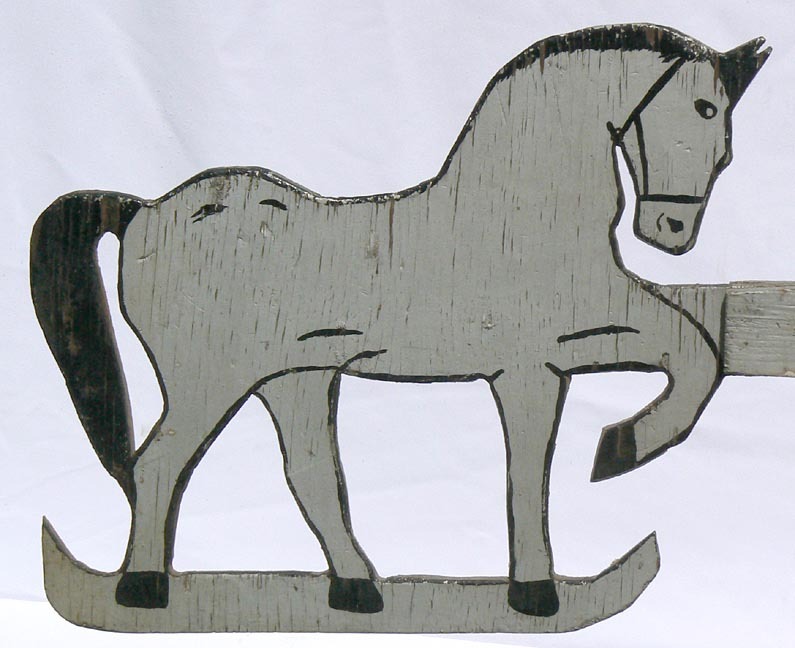 The horse is cut from 1/2" plywood; the arrow is solid wood 1 1/2" thick. 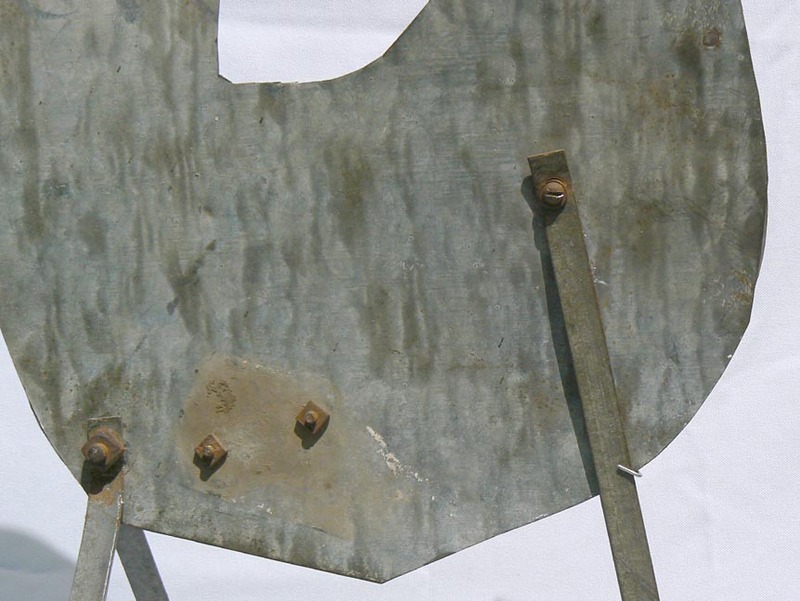 There is a metal plate with a hole for the pivot underneath. 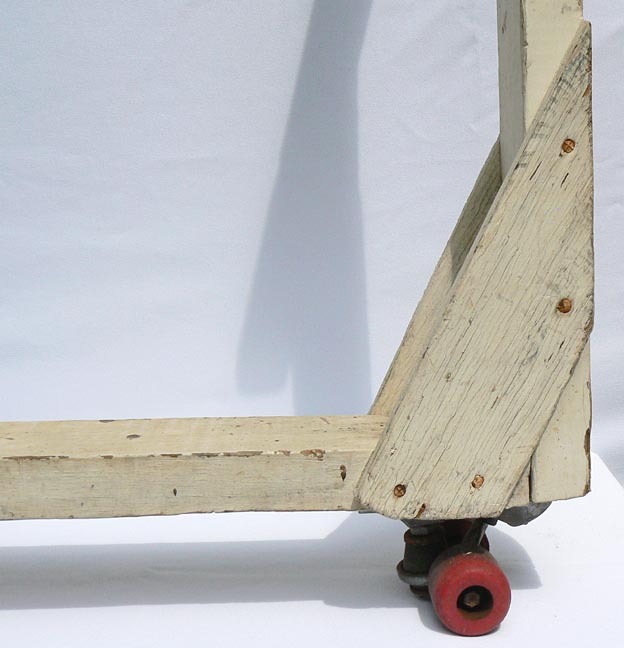 From Indiana, c. 1940's, it is in very good condition with a few very minor chips. The price is $295.00. Inventory Code: ASHS. 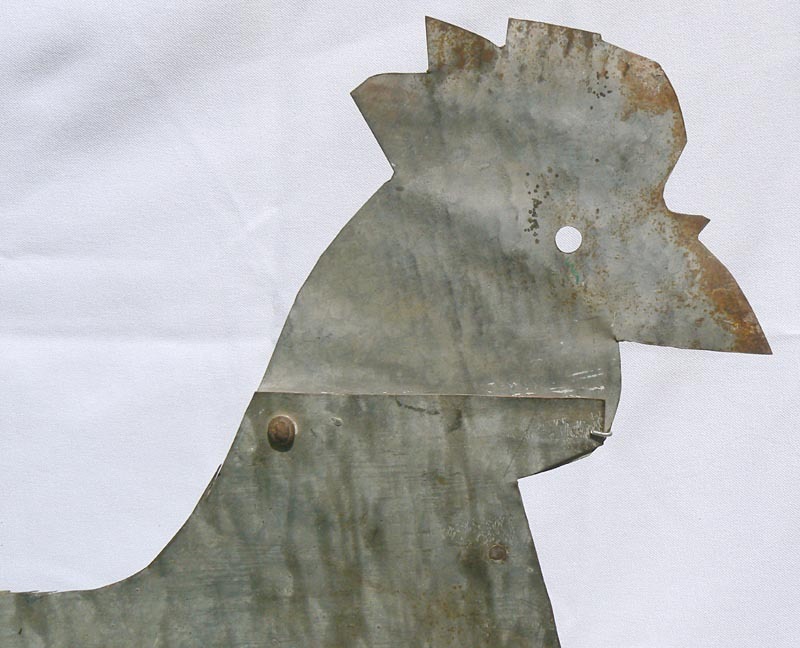 Horse weathervane ... The other side ... Closeup of the horse ... Closeup of the horse, other side ... Closeup of the arrow and sparkplug ... Closeup of the arrow, other side ... From above ... From below. 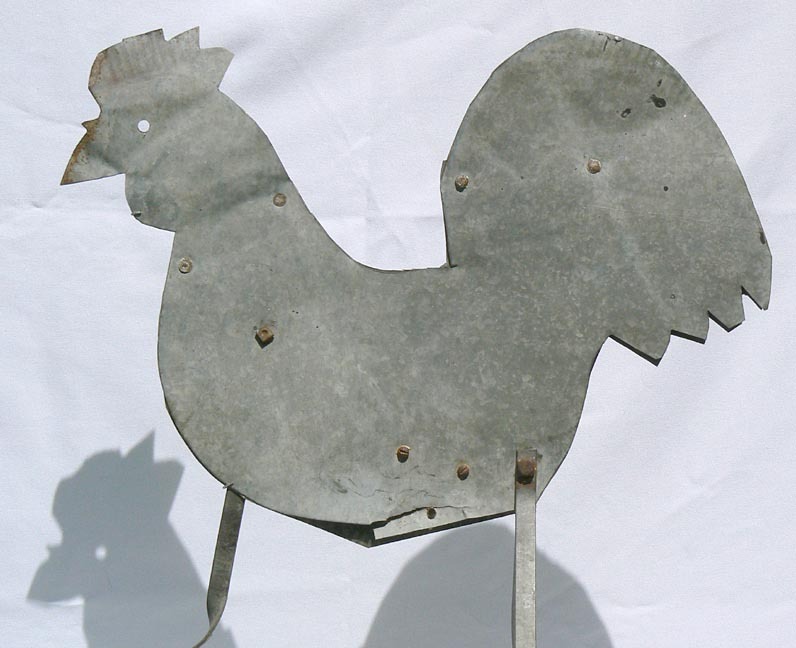 This is a very folky one-of-a-kind rooster weathervane made from galvanized sheet metal. 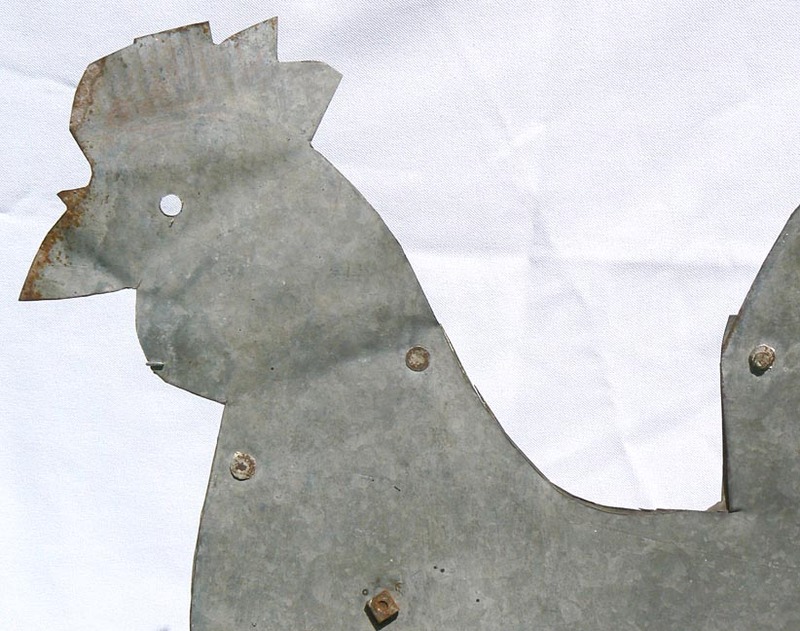 The rooster was hand cut from two pieces and put together. 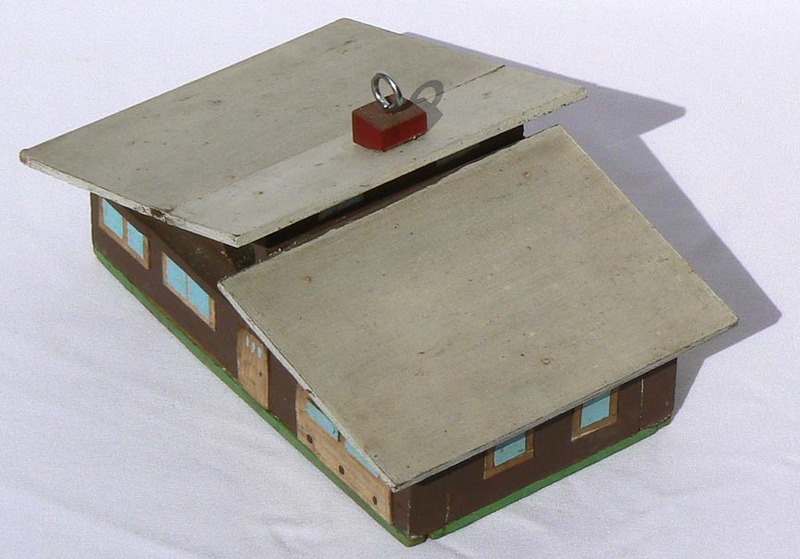 It then was bolted with supports to part of a ventilator from a silo or barn, which had a shaft with a hole put inside so the entire piece could rotate in the wind. 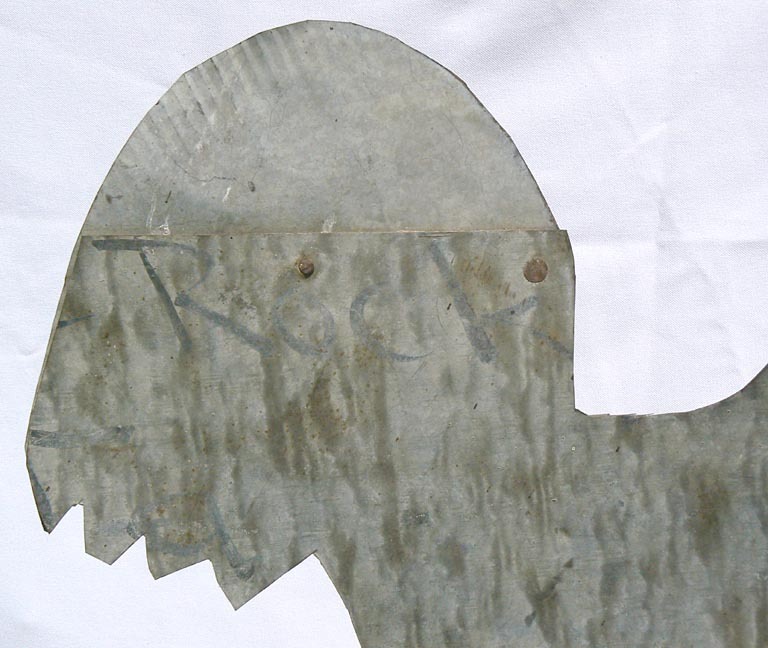 The word "Rock" is painted on one side of the tail in subtle, silver-gray paint. 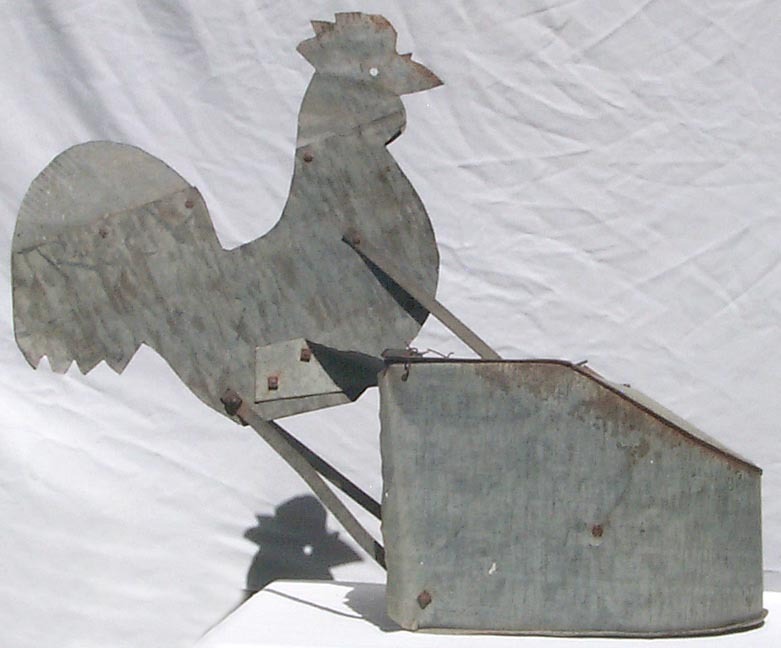 This unusual piece came from the Midwest, likely Iowa, and was probably made in the 1940's or 50's. 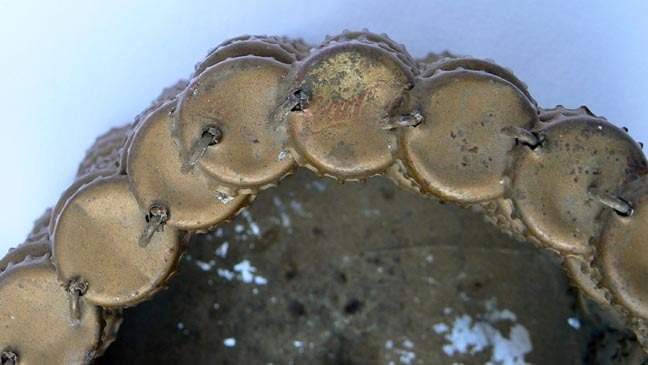 Being metal, there is some little rust, oxidation, and outside wear, but it is in generally very good condition. 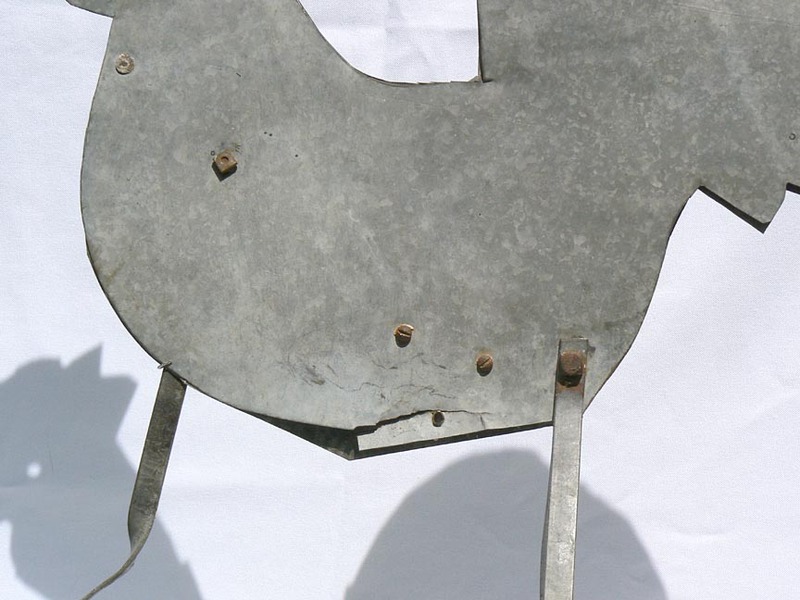 The body of the rooster is 23" long by 19" high. 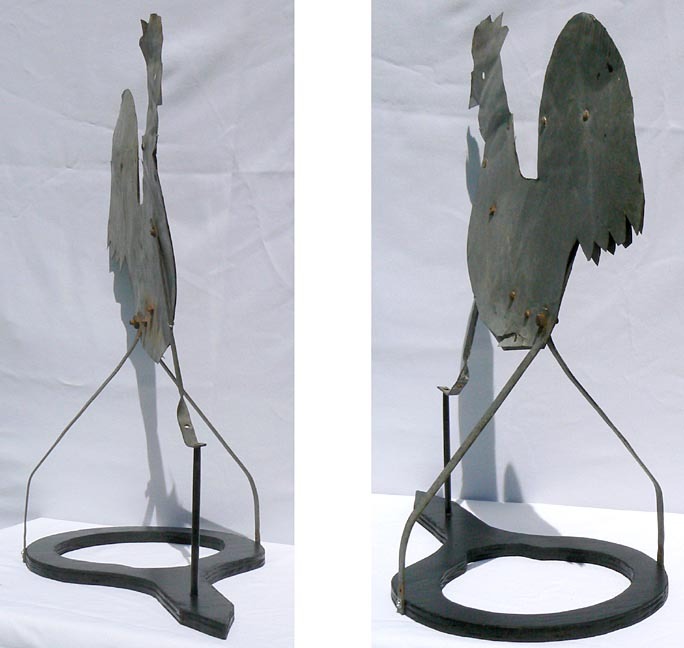 As mounted, it is 26 1/2" long by 28 1/4" high by 13 1/2" wide. 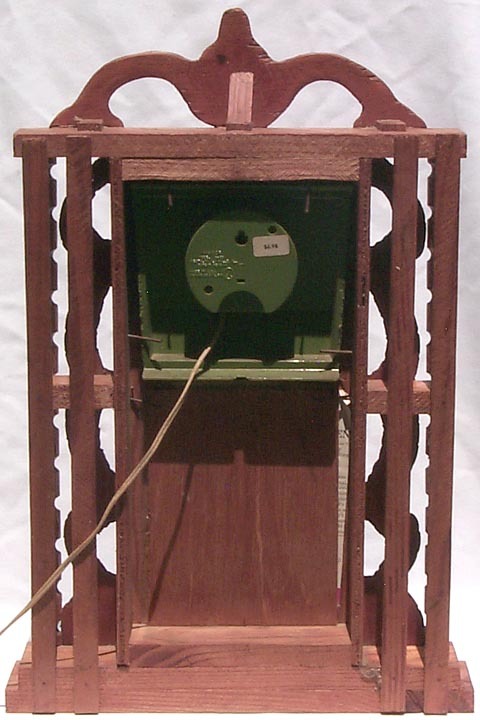 We still have the ventilator, and it can be easily reassembled if you prefer it mounted that way. The price is $475.00. Inventory Code: AKOT. 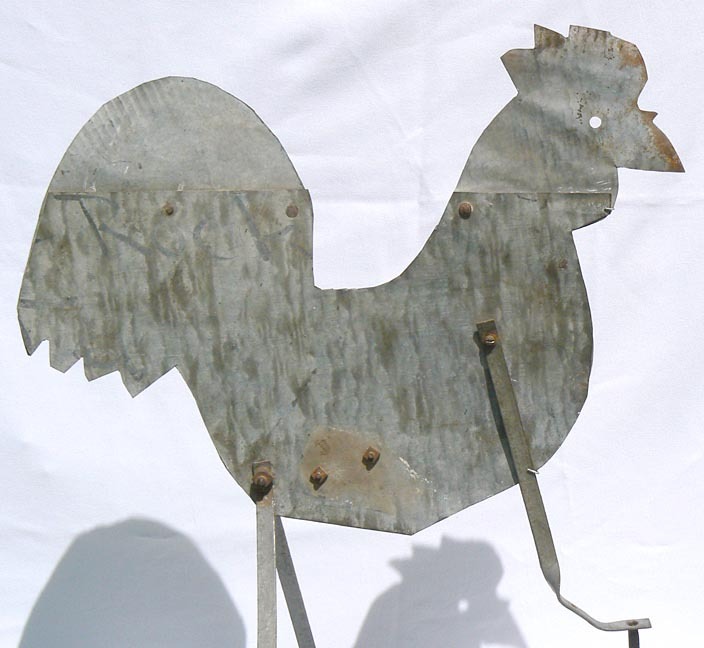 See a slideshow of several views [518k] ... Metal rooster ... The other side ... Another angle ... Closeup ... Closeup, other side ... Closeup of head ... Closeup of tail, with "Rock" ... Closeup of body ... Closeup of head, other side ... Tail, other side ... Body, other side ... Front and back views ... Closeup from the front ... Closeup of the base ... 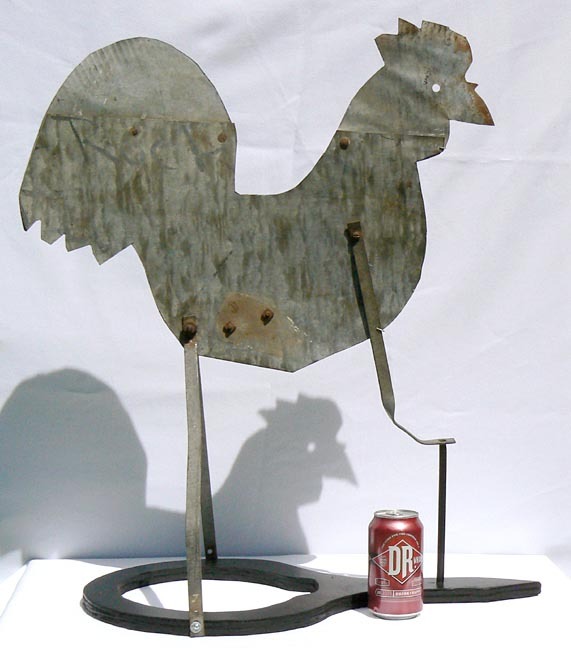 Mounted on the ventilator ... Front view, on ventilator ... With a soda can for scale. The first is a darker brown. 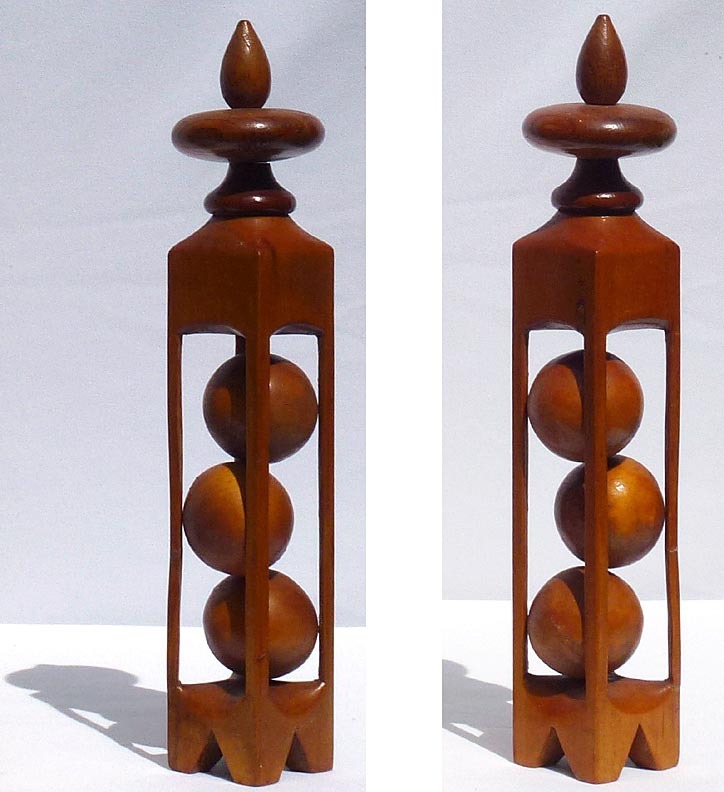 It has a turned top that tapers down, then flares back out to a single caged ball. 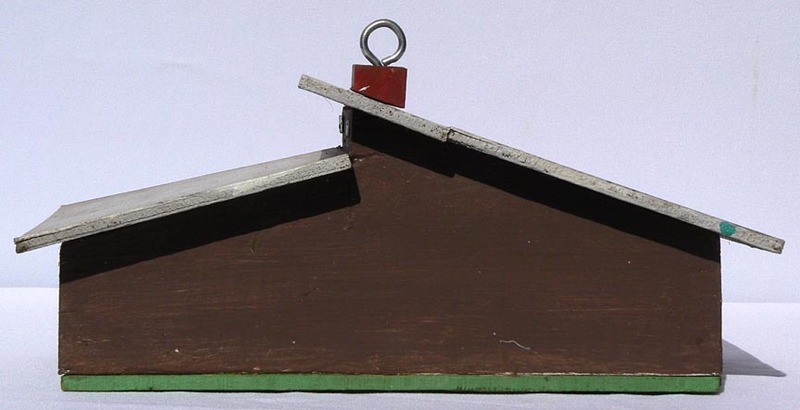 There is a metal hook at the top for hanging. 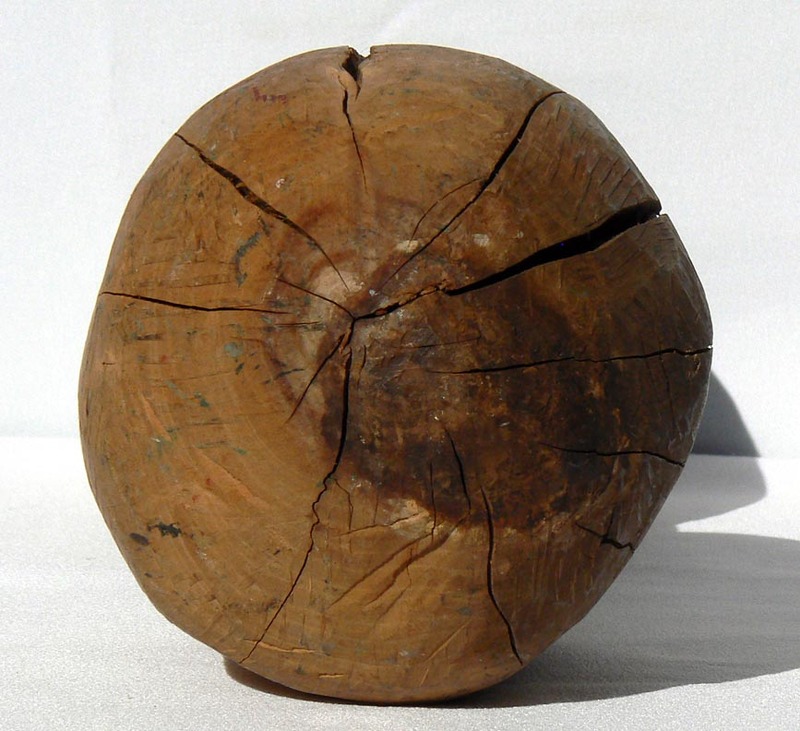 This one has a couple of age cracks, and has been broken and reglued on one corner. 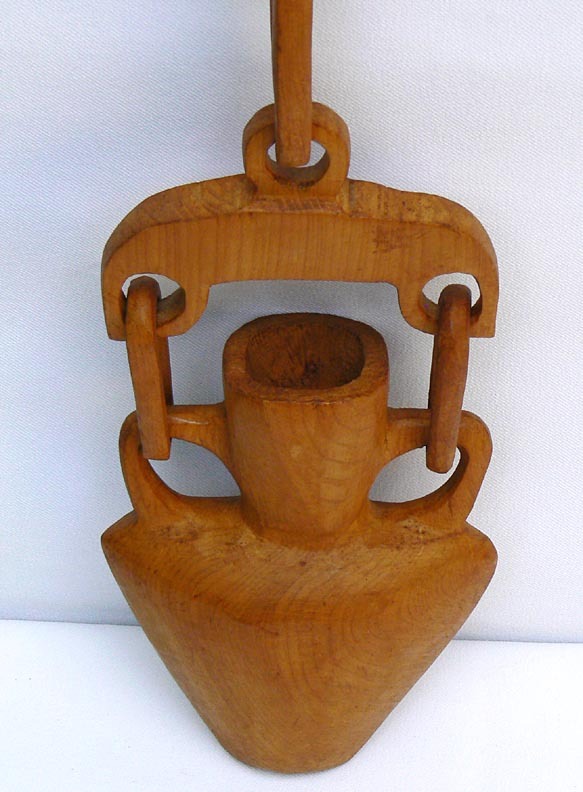 It is 8 1/4" tall, excluding the hook, by 2 1/4" square. The price for this one is $250.00. Inventory Code: CTHC. The second and smallest is the most detailed. 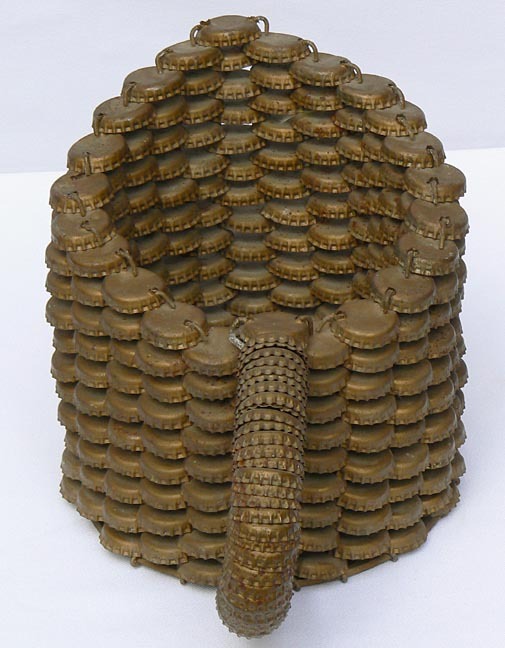 It is an assemblage of three pieces in a warm, medium golden color. 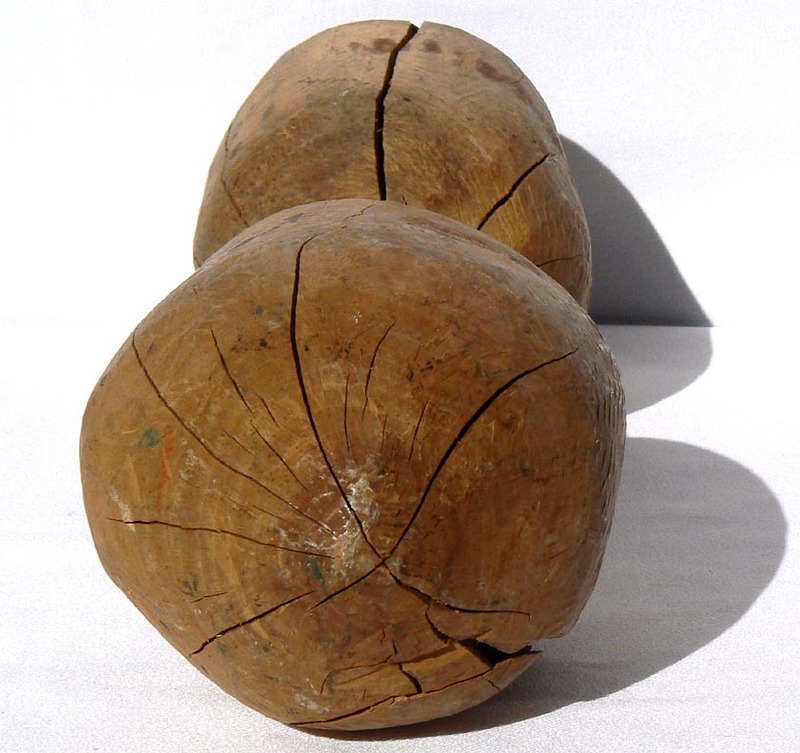 One is a tiny ball in cage with a carved crest on top. 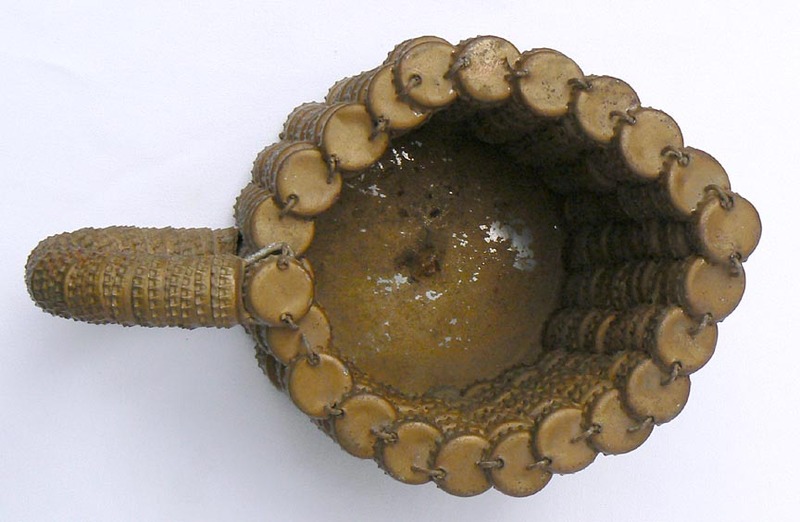 This is mounted inside a separate, larger cage with a carved crest and shaft with a very round ball on top. Finally, that cage was mounted on a three-tier base. 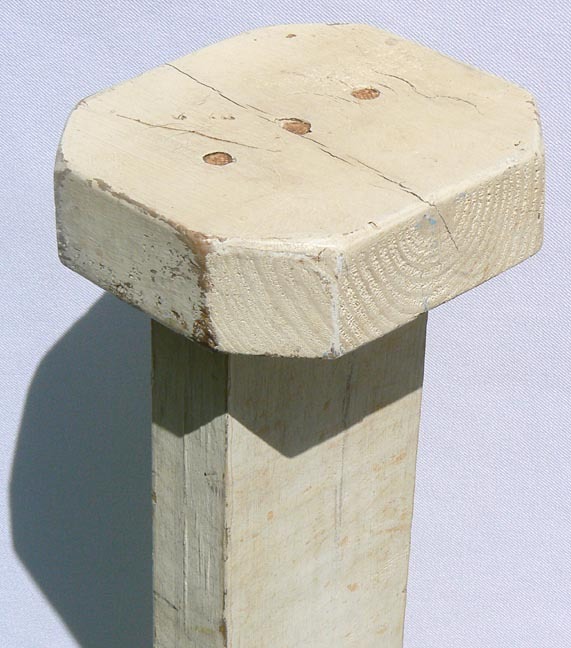 The steps of the base were carved out of a single piece, with tiny dowels set in the corners like fence posts. 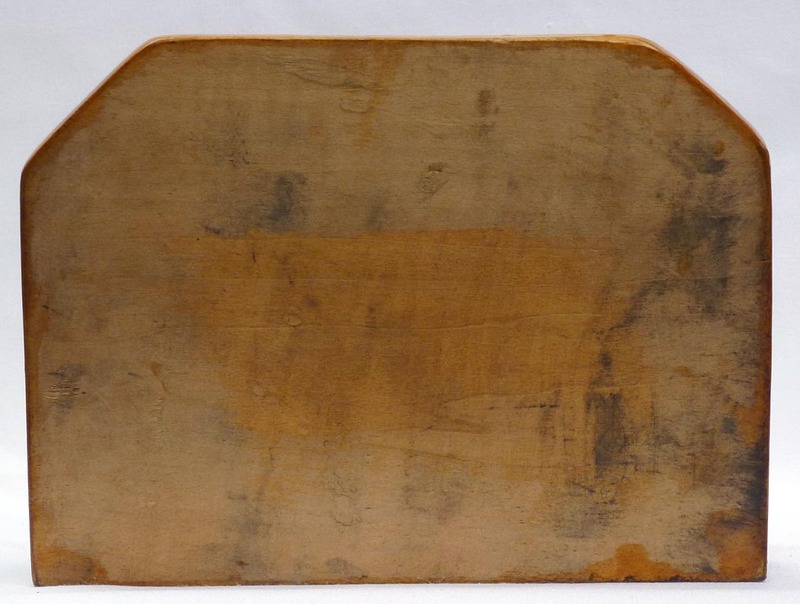 It is 7 1/2" high by 4 3/8" wide by 3 3/8" deep, in excellent condition. 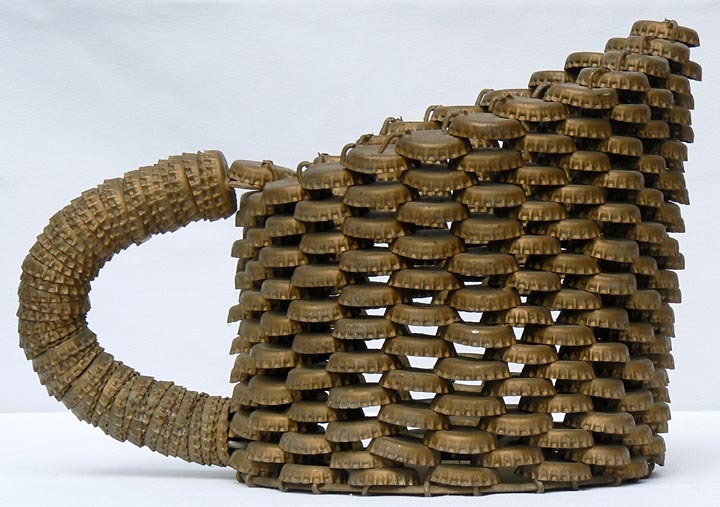 The price for this one is $375.00. Inventory Code: CTHH. 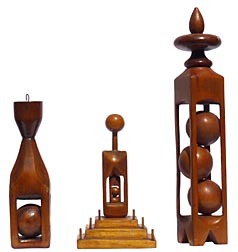 The third whimsy has a long cage with three large, very round balls, topped by a finial turned from a second piece of wood. It is 13 3/4" tall by 2 1/8" square. One corner of the cage has been broken and reglued. The price for this one is $375.00. Inventory Code: CTHT. 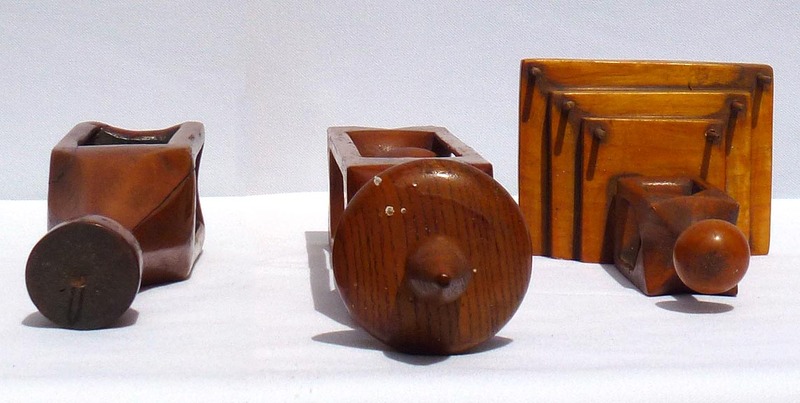 Three whimsy carvings by the same maker ... 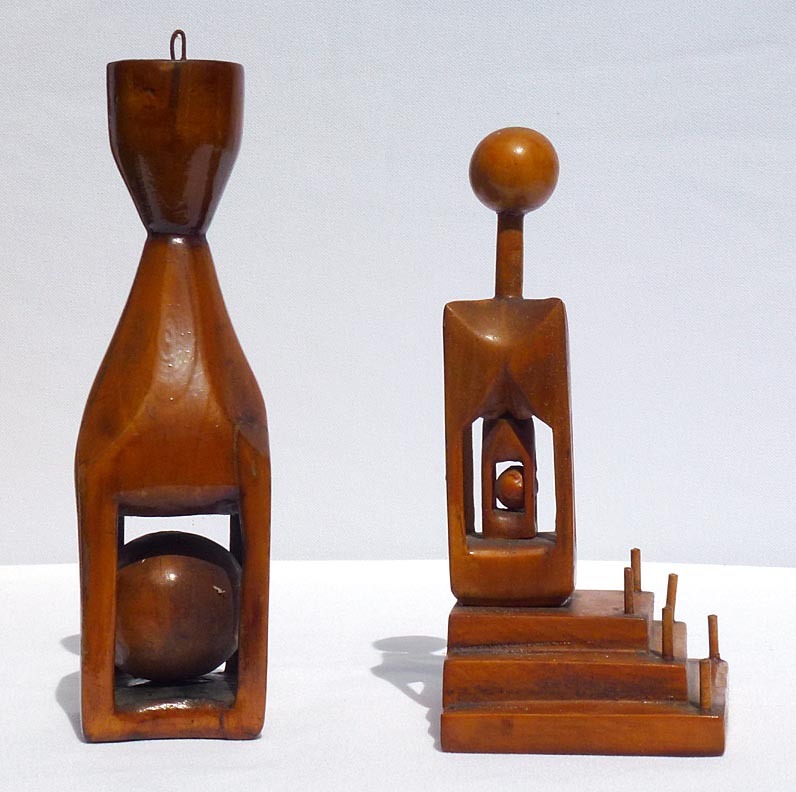 The taller whimsy, two views ... The two shorter ones ... Another angle ... Third view ... One side ... The other side ... Back view ... All three, from above ... From below ... With a soda can for scale. 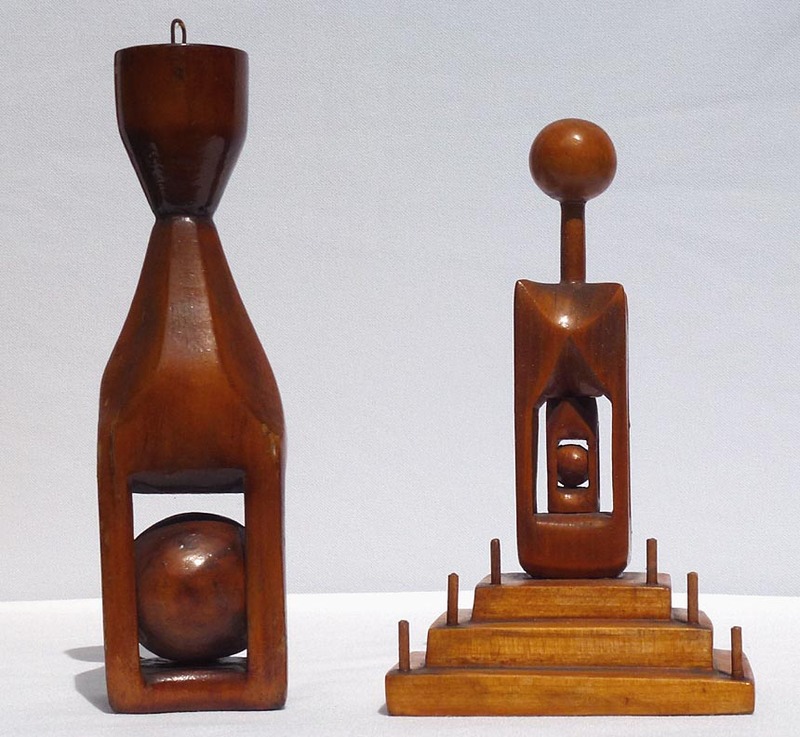 Some much larger photos: Three whimsy carvings by the same maker ... 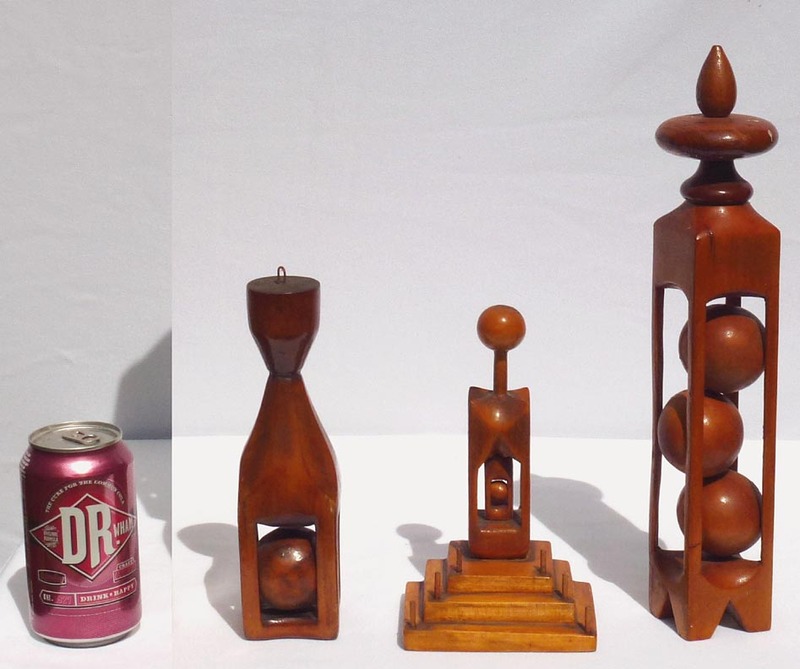 The taller whimsy, two views ... All three, with a soda can for scale. 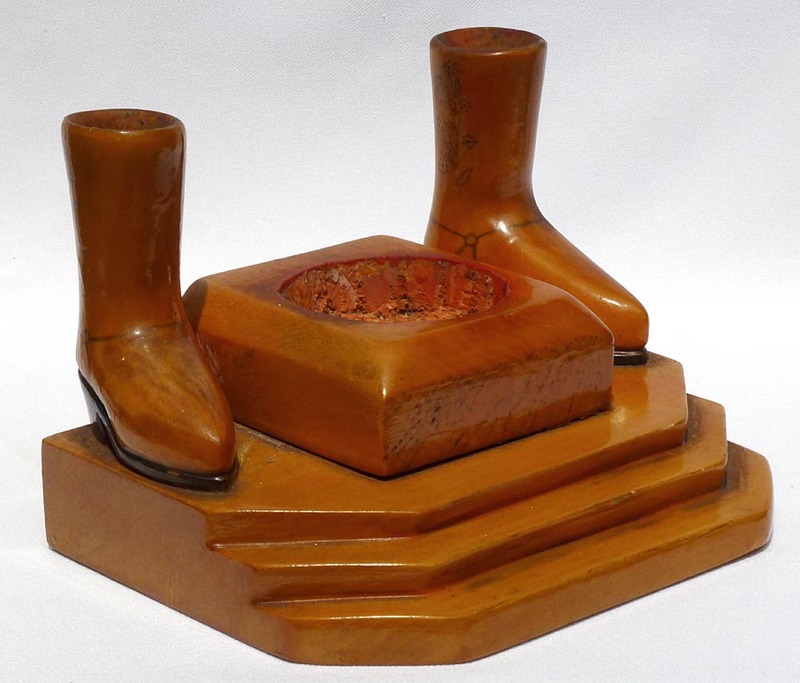 This is a hand made and carved cowboy desk set assemblage. 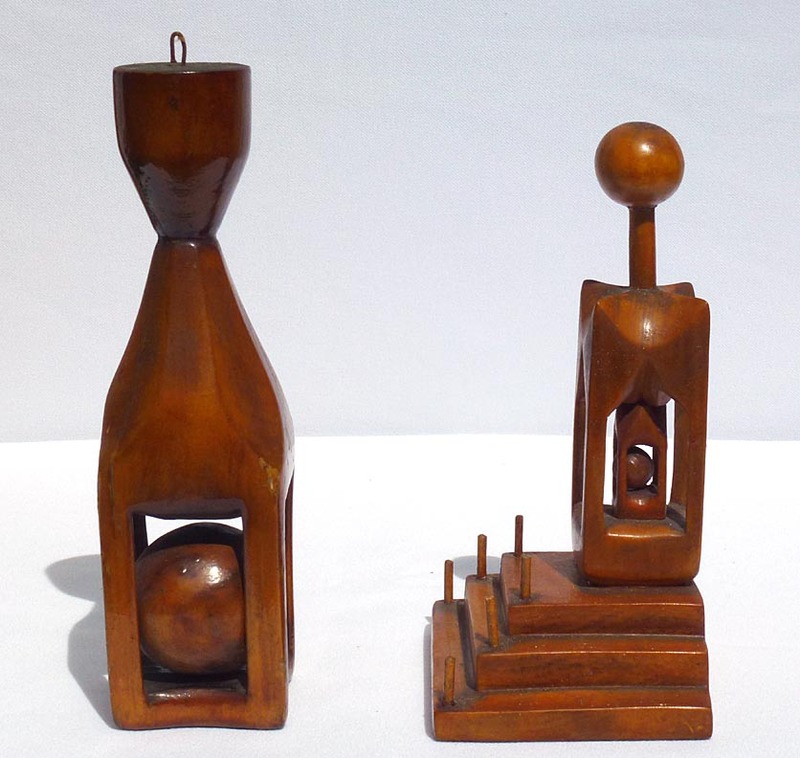 It was apparently made by the same person who did the set of four whimseys above; they all are in the same wood, finish, and feel. 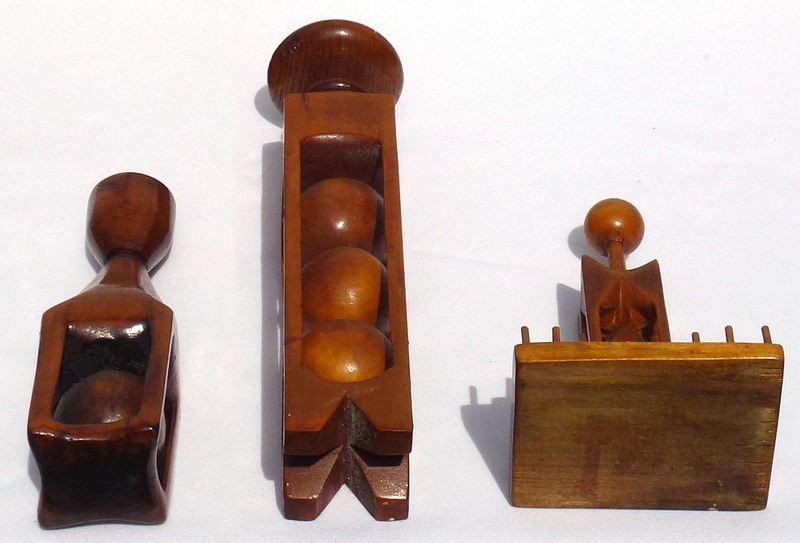 This desk set has a three step base carved from a single piece of wood. 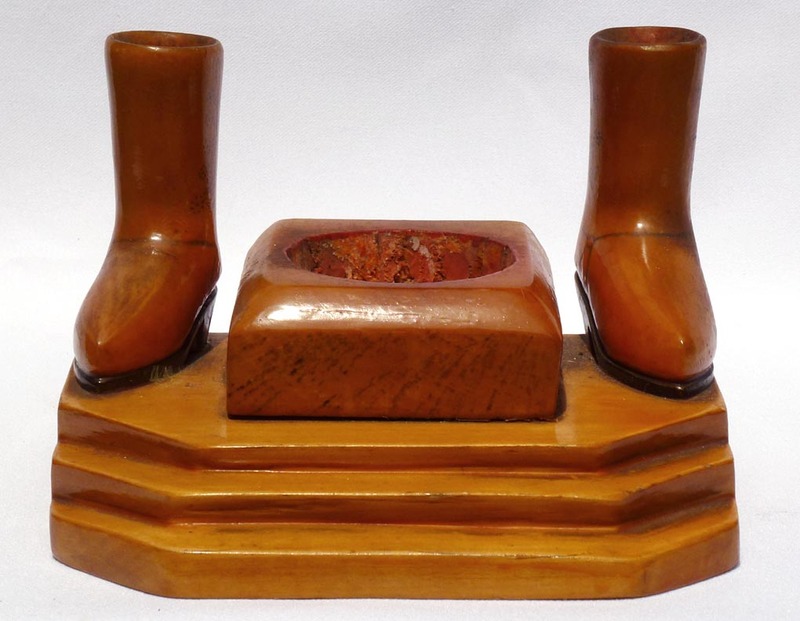 It is topped by a pair of carved and decorated boots and a rectangular section with a deeply carved round area. 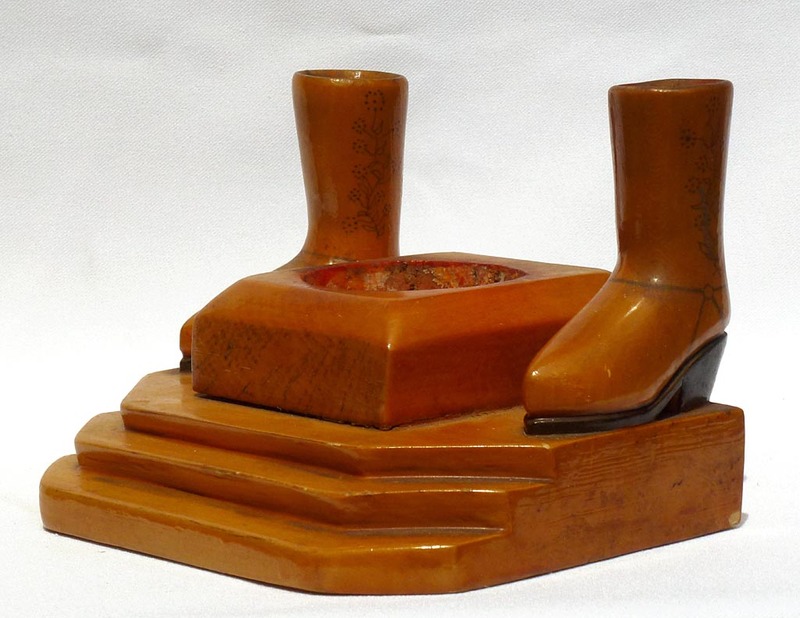 The boots are carved out to hold pens or pencils. The center area could contain paper clips, rubber bands, or odds and ends. All the pieces are pine. 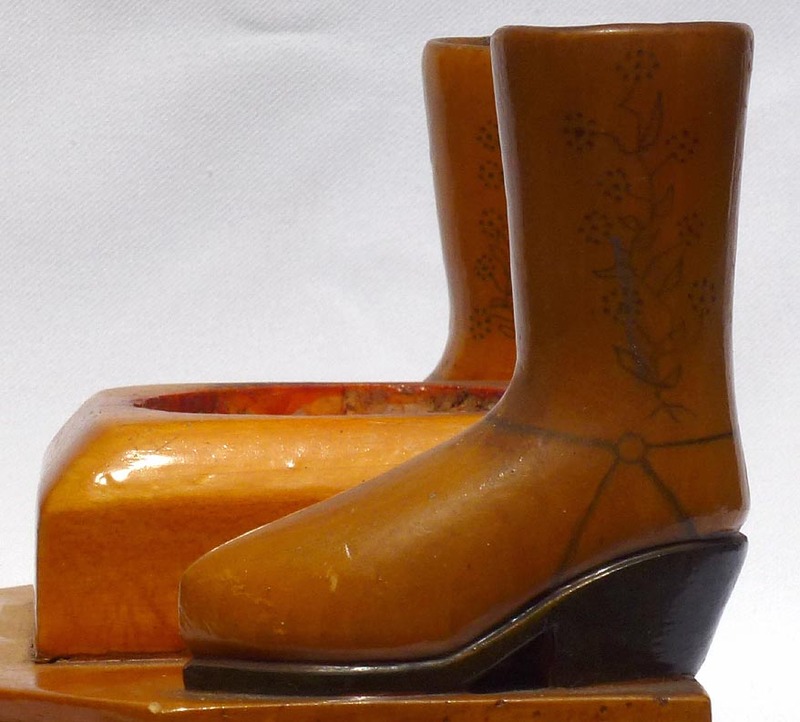 The boots also have been decorated with fine inked and pencilled vines and flowers. The soles are painted or inked black. 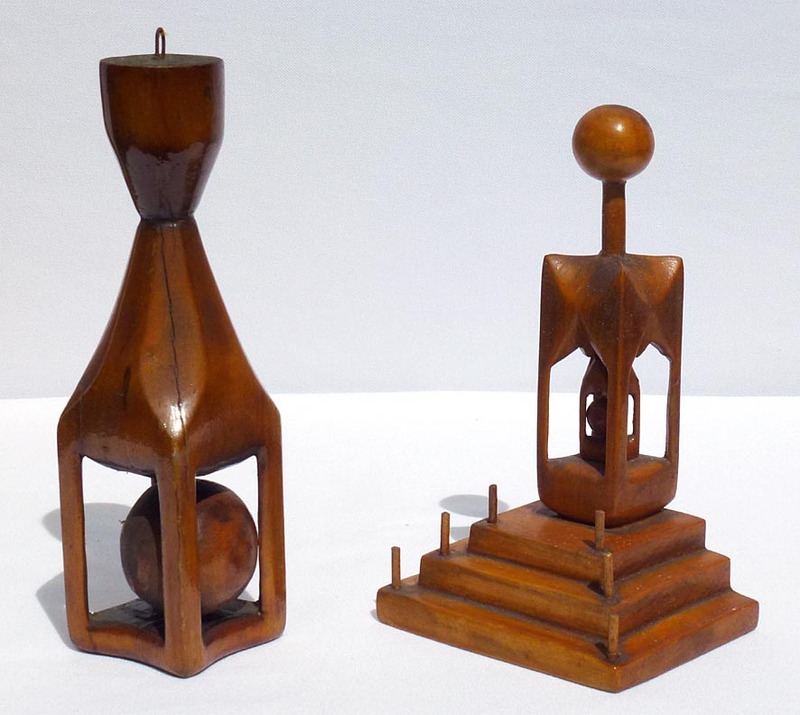 All this has then been finished in fine lacquer or varnish. 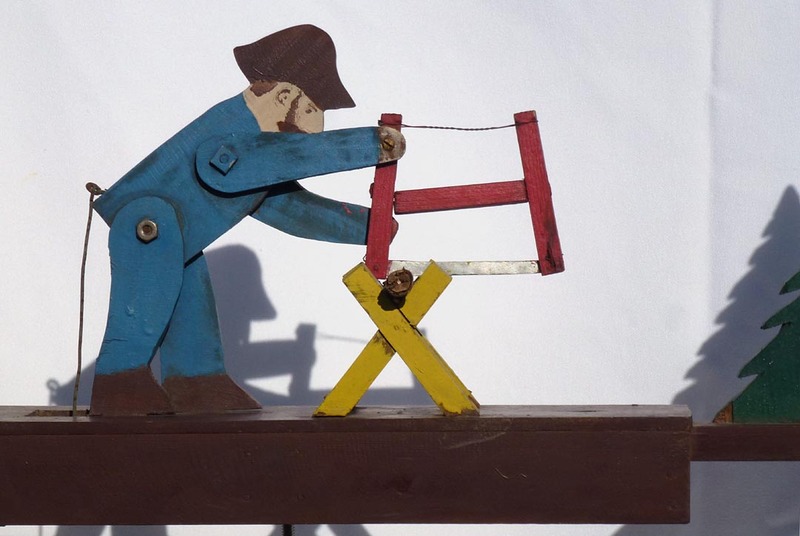 The piece was likely made about the 1940's or '50's. The base is 8" wide by 6" deep. 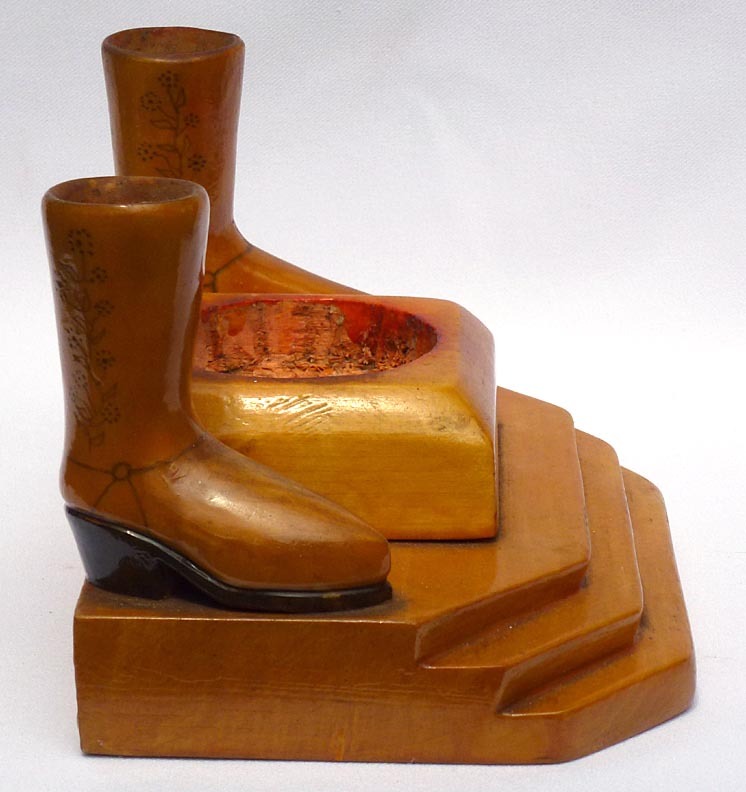 The boots are each about 4" high by 3 1/2" deep by 1 1/2" wide. 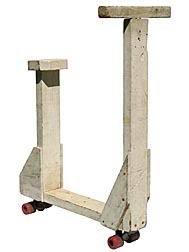 The overall height is about 5 1/2". 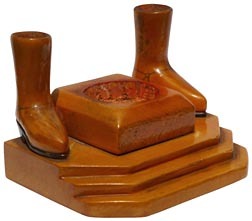 It is in excellent condition with one small chip in the finish on the base. The price is $225.00. Inventory Code: CTHO. See a slideshow of several views [661k] ... 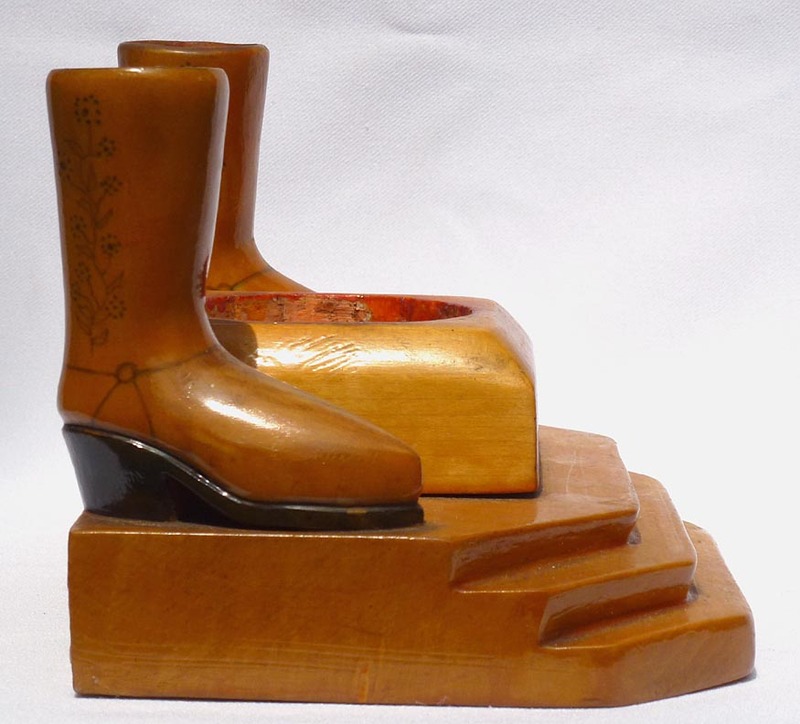 Carving with cowboy boots ... Another angle ... Front view ... Side view ... Closeup ... The other side ... Another view ... Back view ... From above ... From below ... With a soda can for scale. 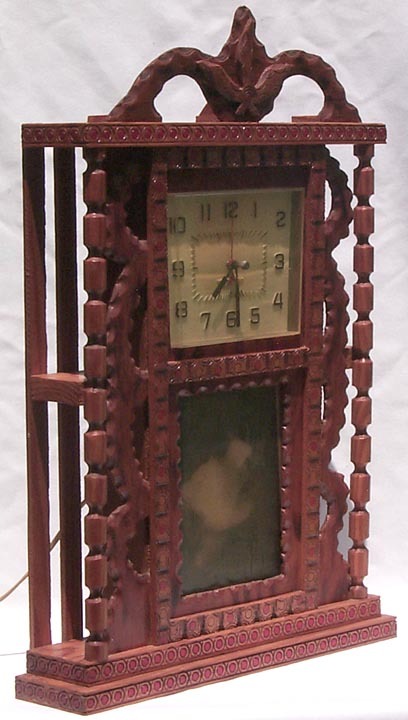 This is a clock case made by the Rev. Howard Finster, with nice painted decoration. It has the original, working clock and original print, and is stamped "Jesus Saves" on the back. 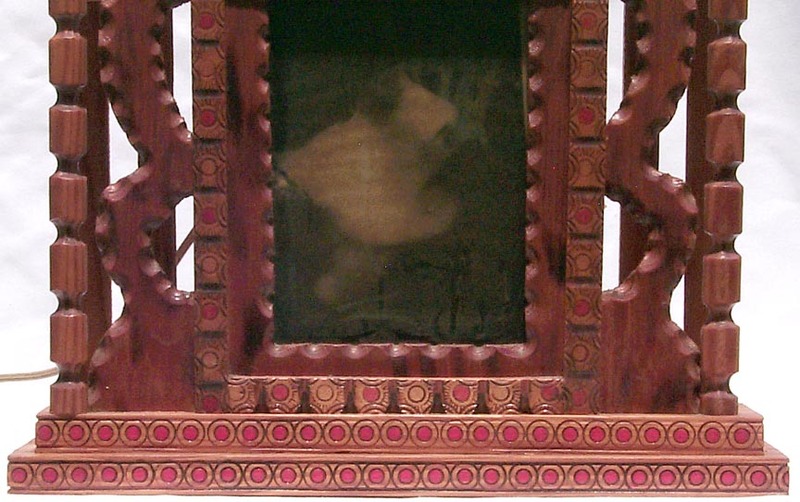 It is carved, layered, and painted. 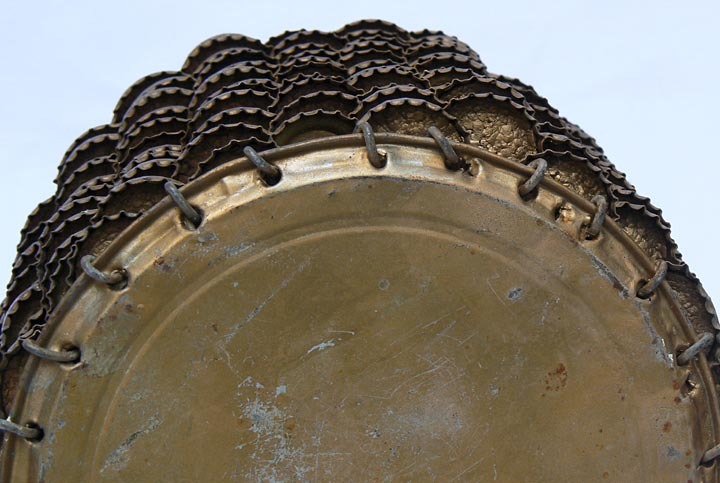 The condition is almost excellent, it does have a small scuff on the top of the crest. 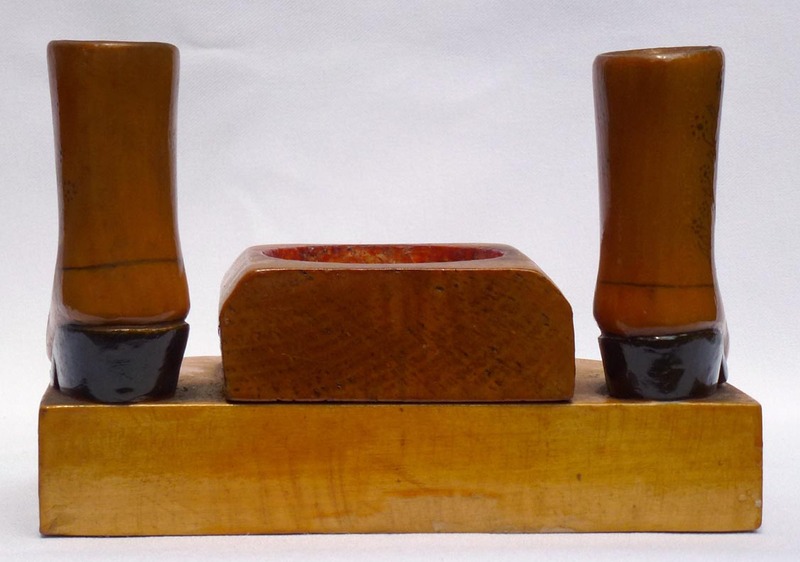 It measures 22 1/2" high by 15" wide by 4" deep. 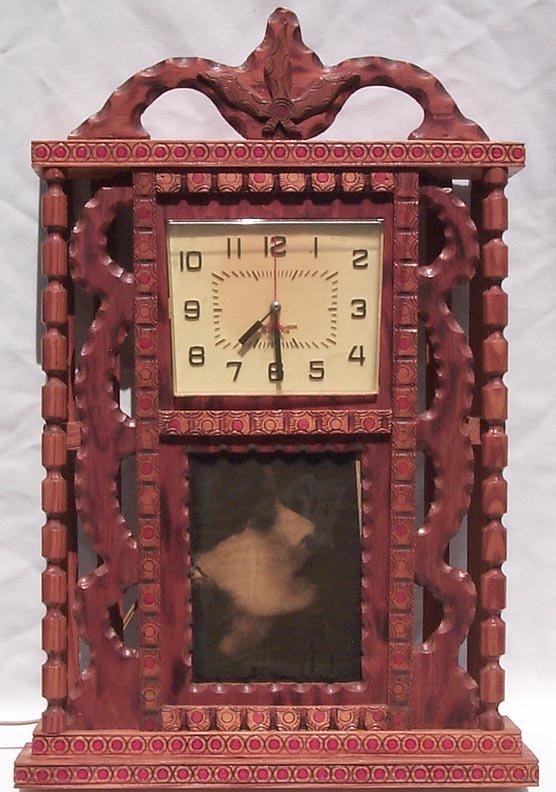 Finster made these clock cases in the 1960's, embossing the designs with dies he made himself. The price is $800.00. Inventory Code: AKKW. We also have other pieces by Howard Finster. 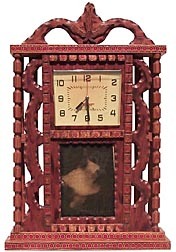 Howard Finster clock case ... One side ... The other side ... Closeup of top ... Closeup of middle ... Closeup of bottom ... Back ... "Jesus Saves" stamp on back ... Another angle. 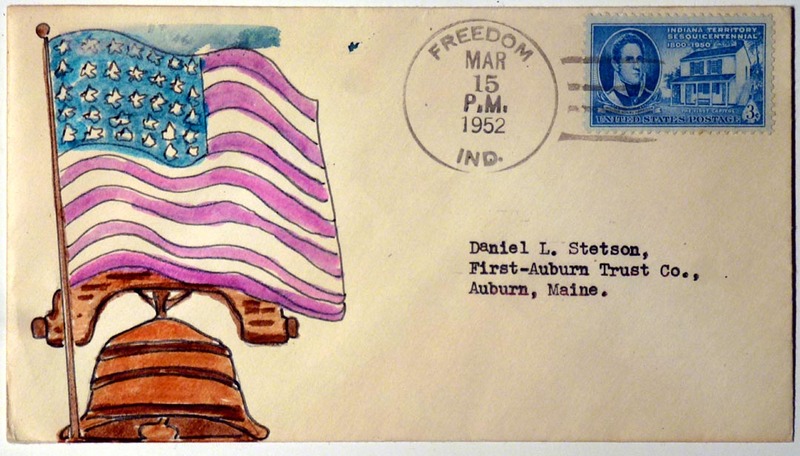 Here is a collection of patriotic drawings done on stamp collector's first day covers. These are 6 3/4 size envelopes with a stamp cancelled on the first day it was issued. Each envelope measures 6 1/2" by 3 5/8", is unused except for the drawing and cancellation mark, and is in excellent condition unless otherwise noted. They are priced individually, with a discount for several. This drawing is a patriotic theme with an eagle, flag, and shield marked "Liberty" in red and black ink. 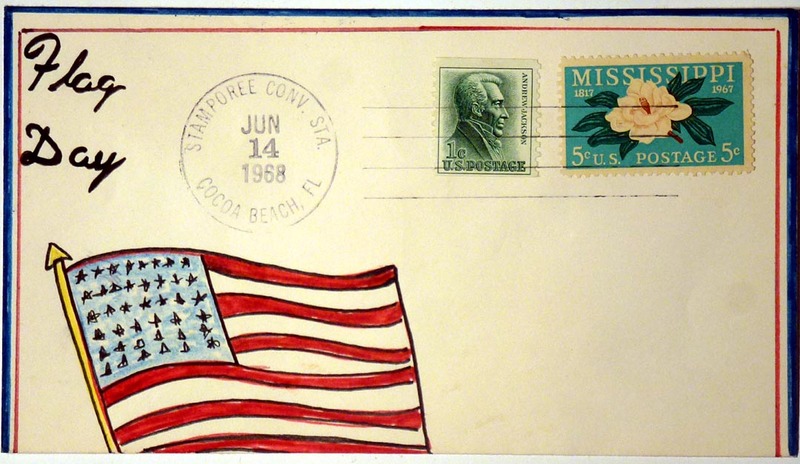 The envelope is cancelled June 8, 1963, "Stamporee Convention Station, Bradenton, FLA". The price is $65.00. Inventory Code: ACCH. 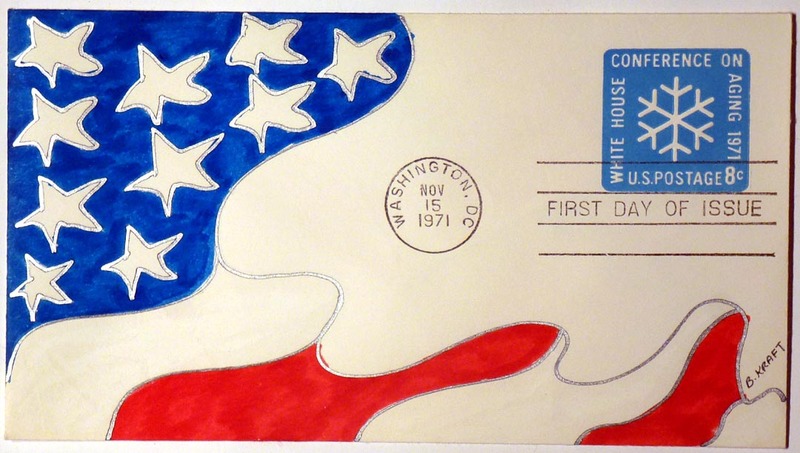 Patriotic drawing on first day cover envelope. Ink and watercolor of a flag and the liberty bell. The stamp recognizes Indiana Territory Sesquicentennial, and is postmarked Freedom, Ind. Mar. 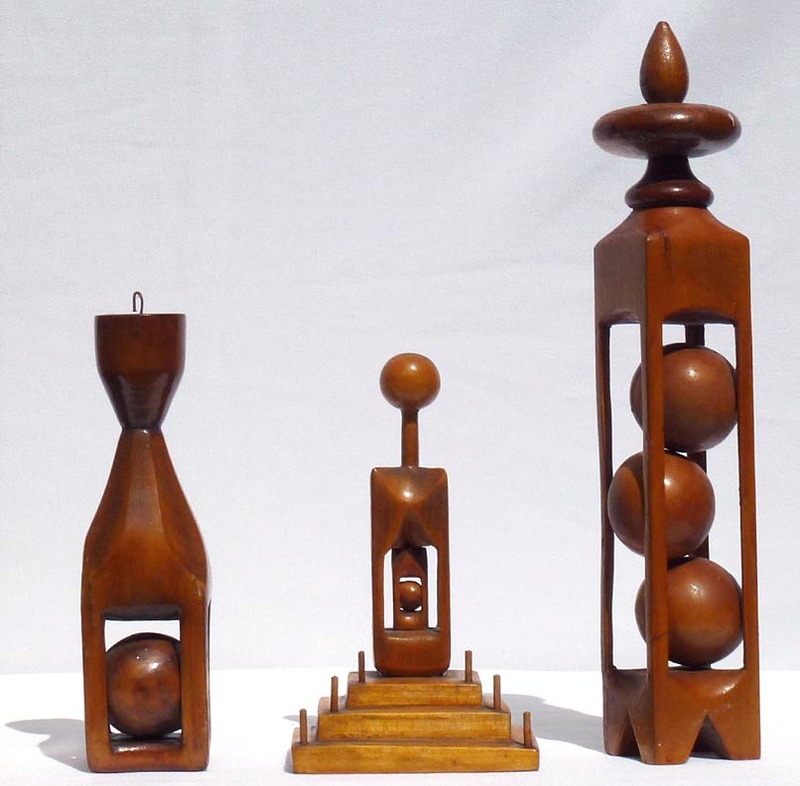 15, 1952. There is a typewritten address. The price is $65.00. Inventory Code: ACHH. 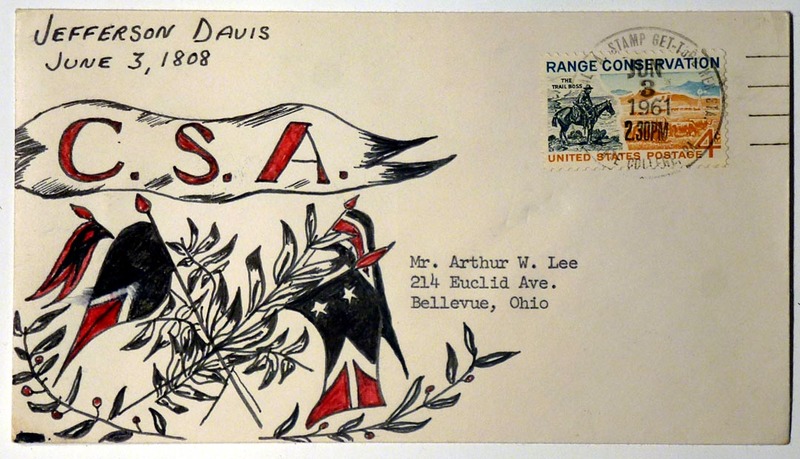 Patriotic drawing on first day cover envelope. 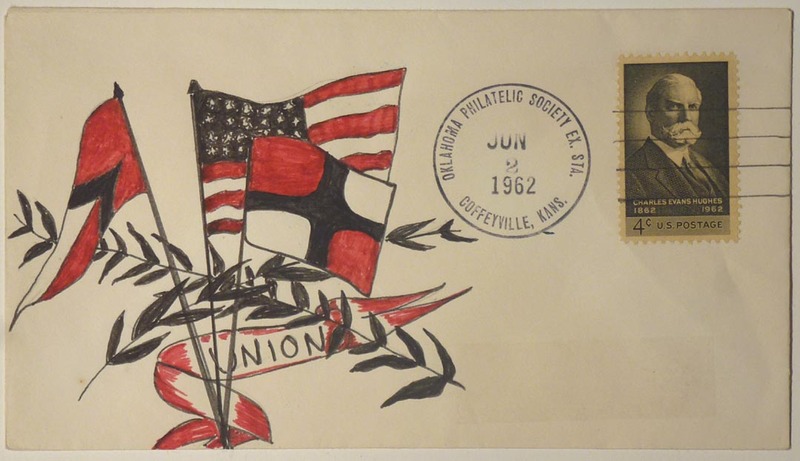 This envelope has a flag, anchor, and shield drawn in red and black ink. The West Virginia stamp is postmarked Aug. 24, 1963. The price is $65.00. Inventory Code: ACCR. 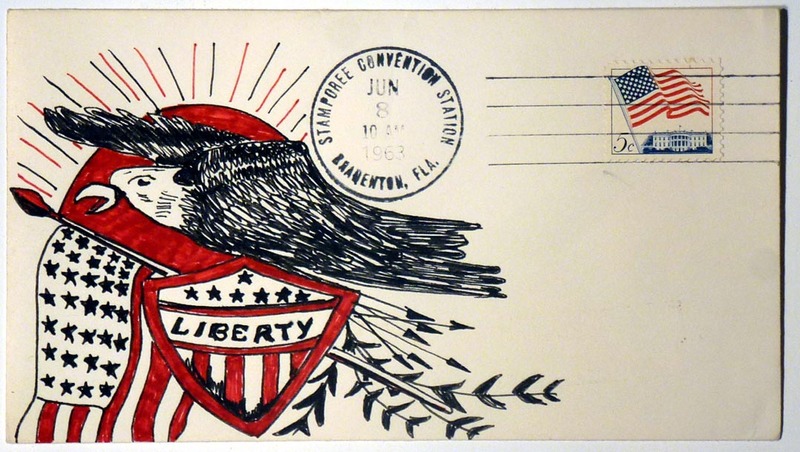 Patriotic drawing on first day cover envelope. Lady Liberty with a flag, rockets and fireworks, drawn in red and black ink. The flag stamp was cancelled in Washington, D.C. Jul. 4, 1957. There is an address sticker attached. The price is $65.00. Inventory Code: ACHO. Patriotic drawing on first day cover envelope. 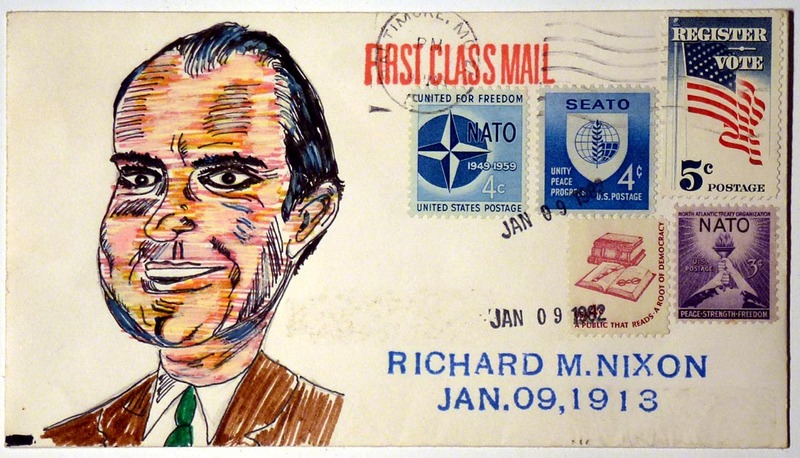 This envelope has an intensely colored sketch of Richard Nixon and the words "Richard M. Nixon Jan. 09, 1913" stamped where the address would go. It was selected because the postmark date was Nixon's birthday. The stamps honor NATO, SEATO, literacy, and voter registration. The cancellation date is Jan 09, 1982. It is in excellent condition. The price is $65.00. Inventory Code: ACHS. Patriotic drawing on first day cover envelope. A flag and the words Flag Day in colored markers. It was cancelled at the Stamporee Convention Jun. 14, 1968. The price is $65.00. Inventory Code: ACHP-A. 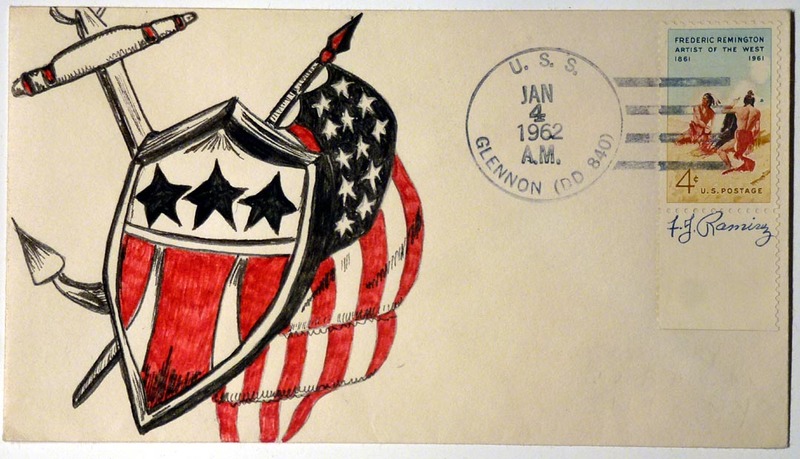 Patriotic drawing on first day cover envelope. A furled or waving flag, drawn in red and black. 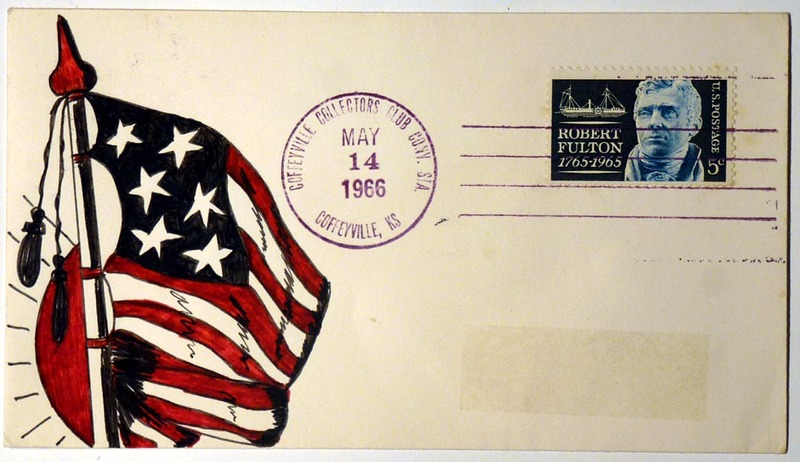 The stamp honors Robert Fulton, and was cancelled May 14, 1966 at the Coffeyville Collectors Club Convention. There is a darker rectangular area on the address part of the envelope. The price is $65.00. 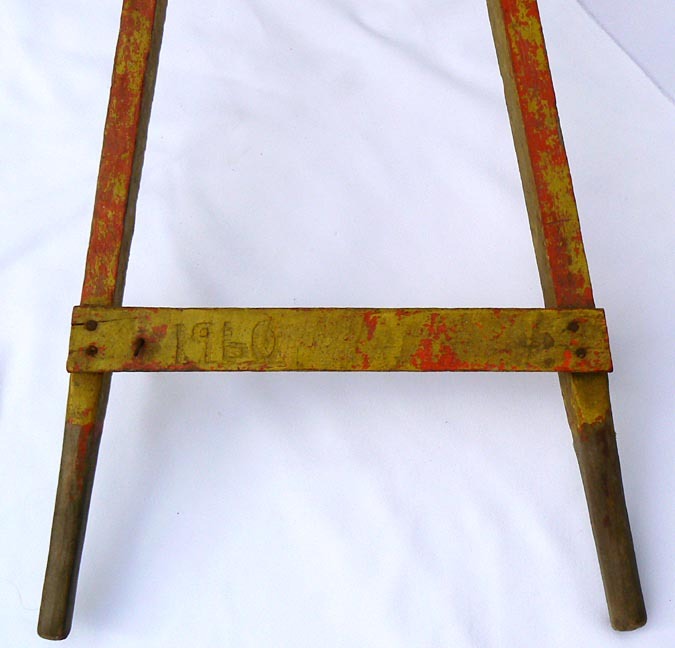 Inventory Code: ACHP-B. 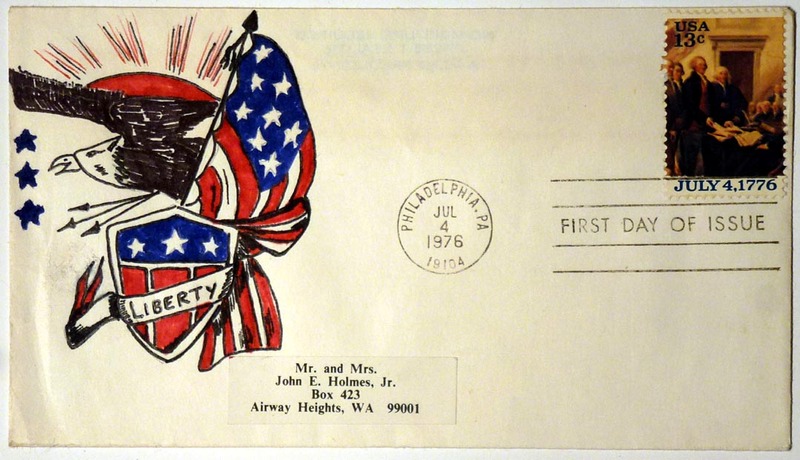 Patriotic drawing on first day cover envelope. This is an abstract flag drawn in red, blue, and silver. It is signed B. Kraft. The printed postage honors White House Conference on Aging, and is cancelled Nov 15, 1971. The price is $65.00. Inventory Code: ACHP-C. Patriotic drawing on first day cover envelope. A folky eagle, sunrise, flag, and shield with "Liberty" drawn in colored markers. The stamp illustrates the signing of the Declaration of Independence, and is postmarked on the Bicentennial: Philadelphia, Jul. 4, 1976. 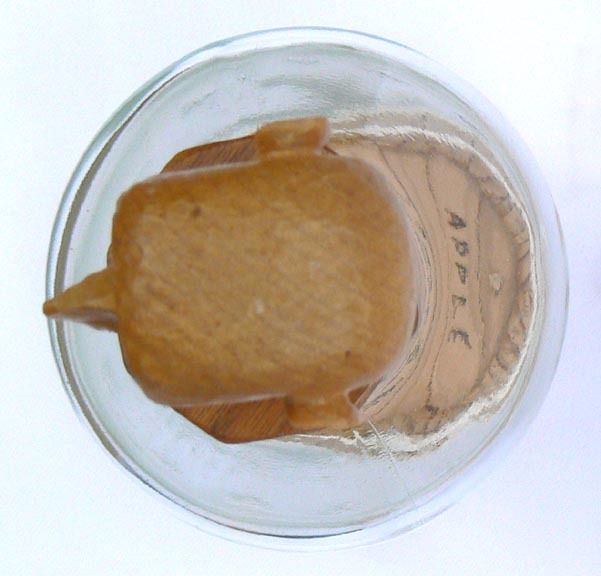 An address label was attached. There is a slight fold on the left hand side. The price is $65.00. Inventory Code: ACHA. Patriotic drawing on first day cover envelope. A flag, pennants, leafy branches, and the word "Union", in red and black ink. The stamp is in honor of Charles Evans Hughes, and is cancelled Oklahoma Philatelic Society, Jun 2, 1962. The price is $65.00. Inventory Code: ACHW. 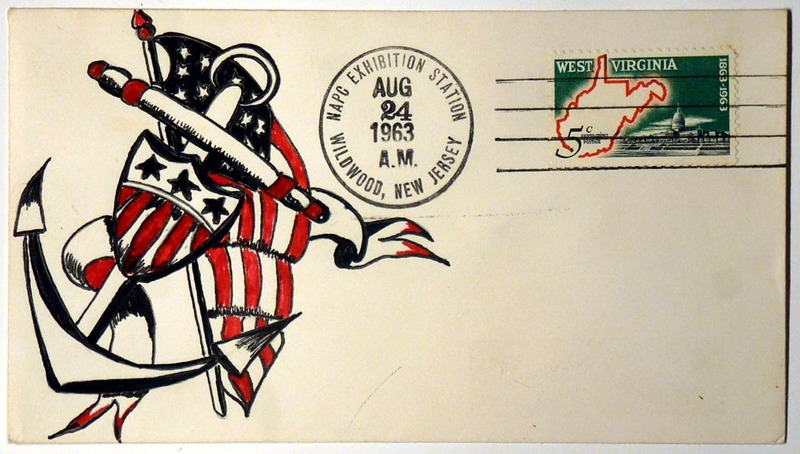 Patriotic drawing on first day cover envelope. Several pennants and leafy branches in red and black ink labeled "C.S.A." and "Jefferson Davis June 3, 1808". The Range Conservation stamp is postmarked Jun. 3, 1961, and has a typewritten address. The price is $65.00. Inventory Code: ACHT. Patriotic drawing on first day cover envelope. Anchor, flag, and shield in red and black ink. The stamp honors Frederic Remington, and was cancelled Jan. 4, 1962, with a signature below the stamp. The price is $65.00. Inventory Code: ACHC. 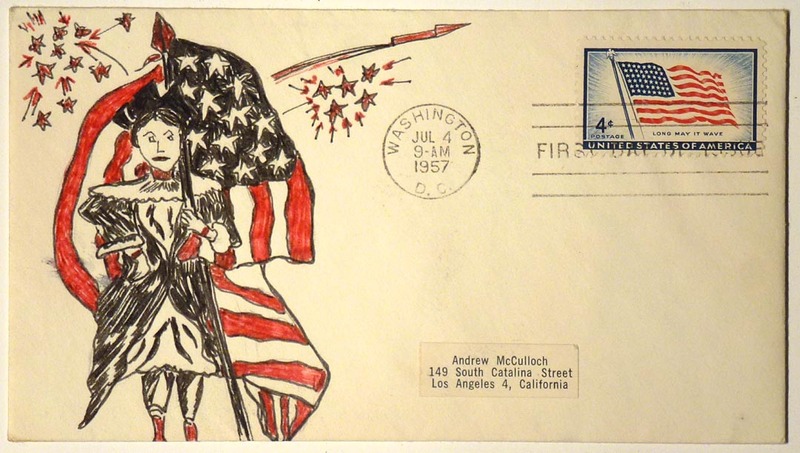 Patriotic drawing on first day cover envelope.